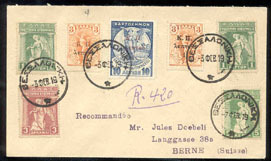 15521 L BELGIUM (1935) Balloon mail. 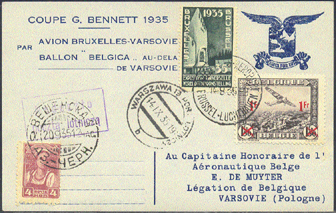 Letter card flown by balloon from Brussels, Belgium to Varsovie, Poland Coupe G. Bennett 1935. 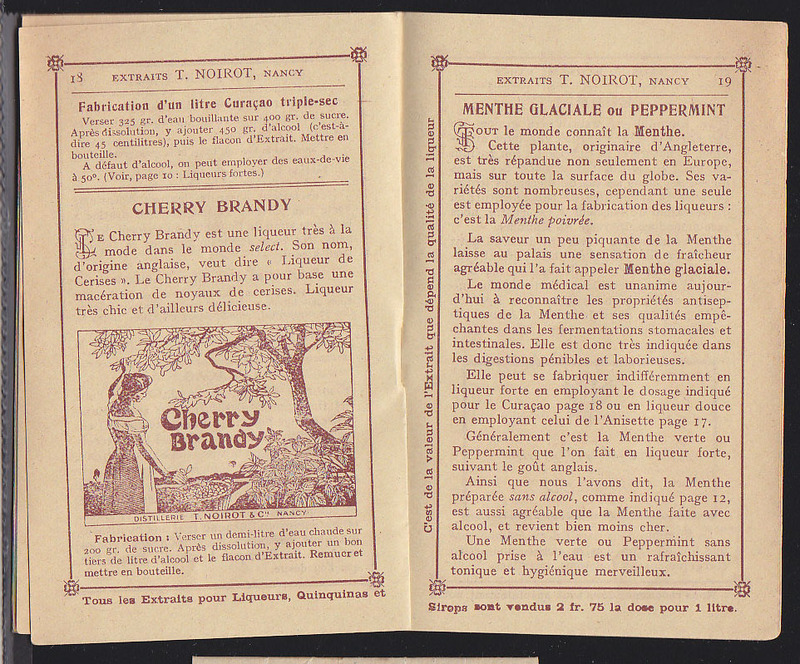 Franked with Belgium Nos 285,C6. 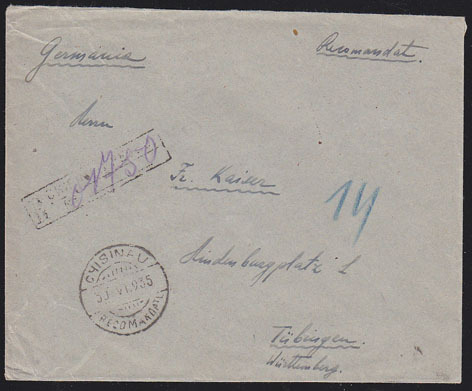 Circular cancels of Brussel-Luchthaven Aeropost, Warsaw and Veshenskaya tying Russia No 416. Rare! 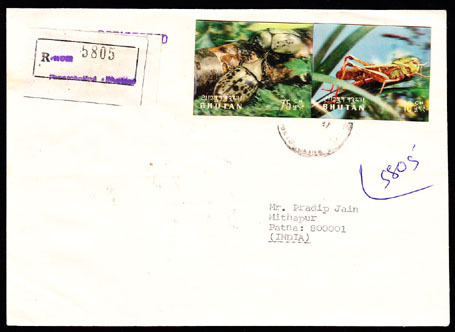 16429 L BHUTAN (1969) Grasshopper*. Rhinoceros beetle*. 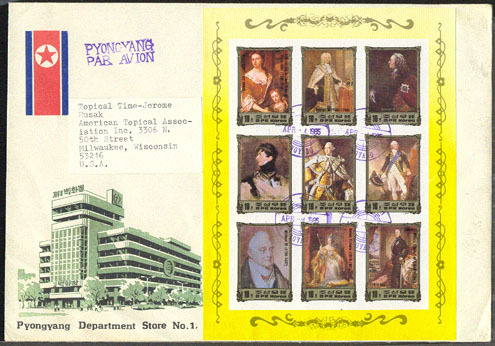 Pair of simulated 3-D stamps used on registered cover. Scott Nos 101,101A. Yvert Nos 216-7. 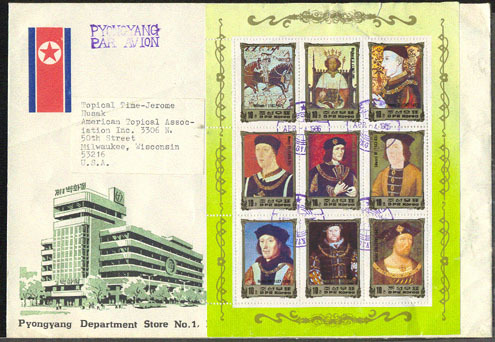 These stamps were sold primarily to dealers and collectors and were hardly ever used on cover. Only 5 such covers discovered so far! 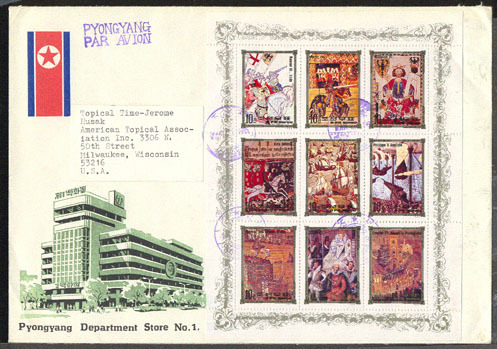 16346 L BHUTAN (1971) Head of Cicero. Registered letter with simulated 3-D stamp. Scott No 126d, Yvert No PA82. 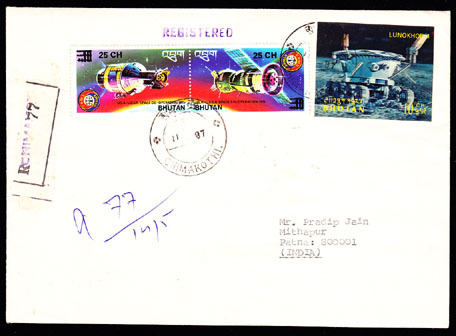 17262 L BHUTAN (1971) Lunokhod*. 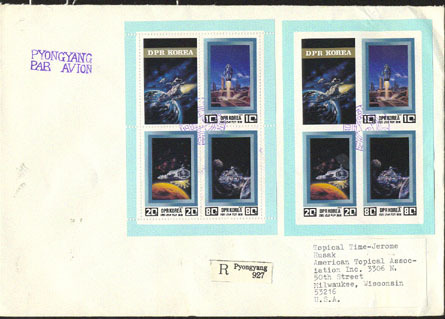 Conquest of Space Series simulated 3-D stamp used on registered cover. Scott No 127, Yvert No 293. 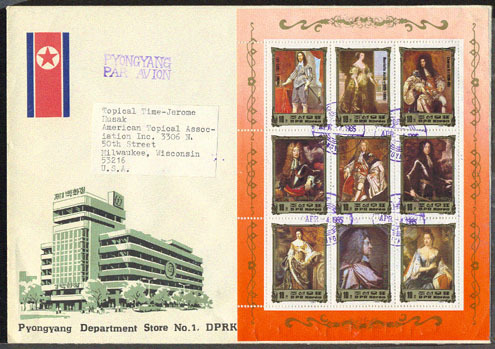 These stamps were sold primarily to dealers and collectors and were hardly ever used on cover. Only 5 such covers discovered so far! 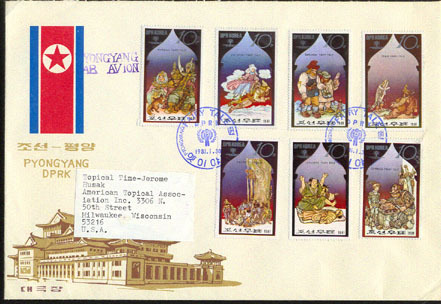 16684 L BHUTAN (1973) Caesar's mushroom*. 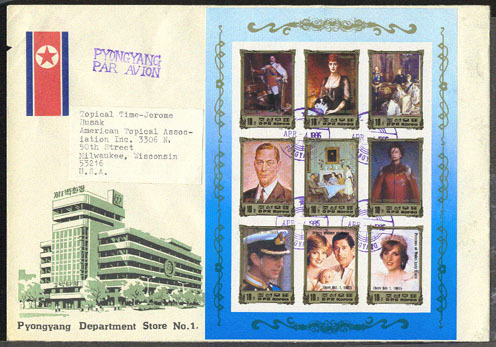 Simulated 3-D stamp used on registered cover. Scott No 154b, Yvert No 425. 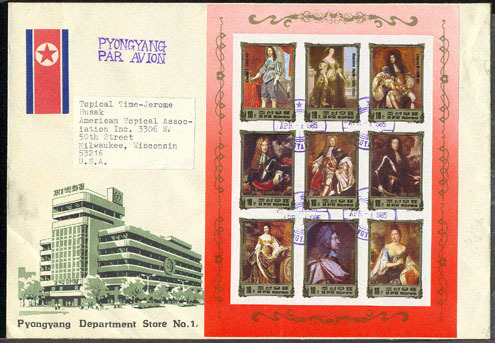 These stamps were sold primarily to dealers and collectors and were hardly ever used on cover. Only 5 such covers discovered so far! 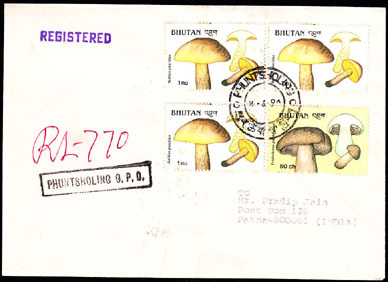 16685 L BHUTAN (1973) Bolete mushroom*. 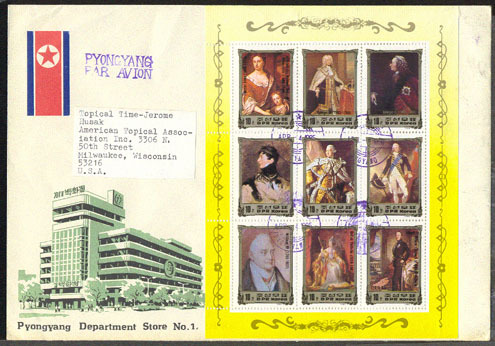 Simulated 3-D stamp used on registered cover. Scott No 154A, Yvert No 424. 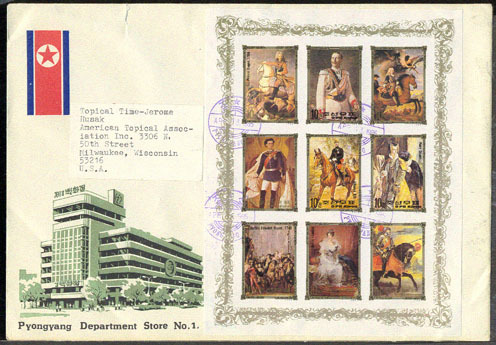 These stamps were sold primarily to dealers and collectors and were hardly ever used on cover. Only 5 such covers discovered so far! 16690 L BHUTAN (1990) Mushrooms. 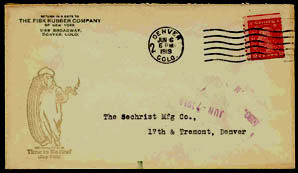 Registered letter franked with 3x Scott No. 714, 1x #713. 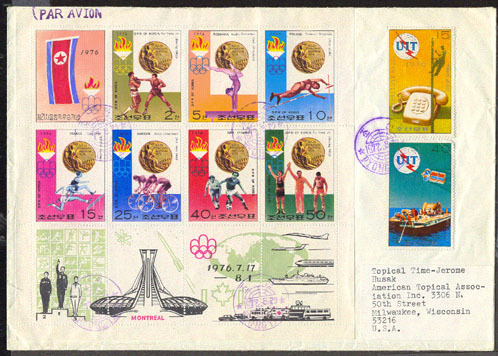 15565 L BRAZIL (1976) Washington*. Truman*. Eisenhower*. Kennedy*. Cleveland*. Roosevelt*. 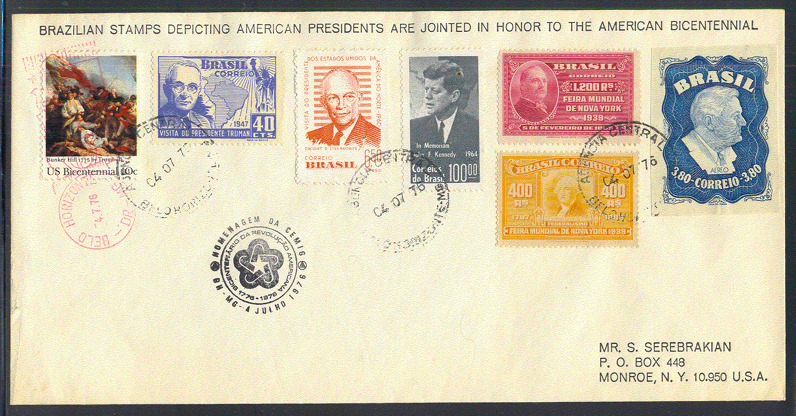 Special commemorative envelope honoring American presidents issued for American Bicentennial. Only 50 were made. 17004 L ECUADOR (1949) Roosevelt*. Plane*. Unlisted official airmail stamp with overprint of Public Works Department used on letter from government department to USA. Sanabria No 264. Only about 50 known usages! 17005 L ECUADOR (1949) Roosevelt*. Plane*. 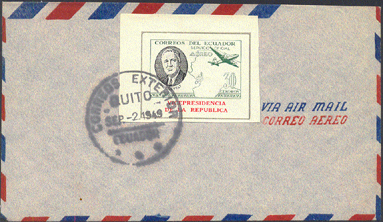 Unlisted official airmail stamp with inscription "Vicepresidentia de la Republica" canceled on envelope (unaddressed). Sanabria No 281. 9403 L JAPAN (1951) Children of the atom bomb*. 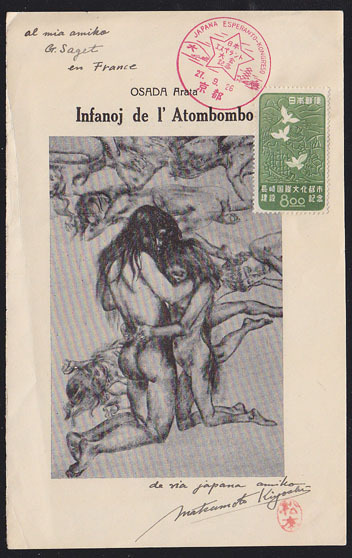 This is what looks like the frontispiece of a book in Esperanto about the effects on children of the atomic bombs dropped on Hiroshima and Nagasaki. Franked with Scott No 466. 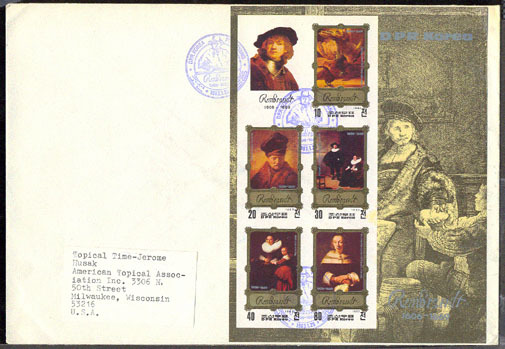 17025 L NETHERLANDS (1937) Scouting. 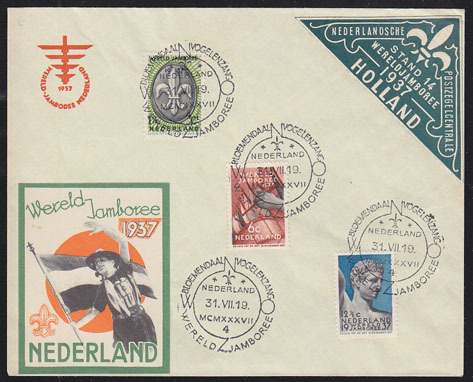 Unaddressed envelope with scout series stamps tied by Wereld Jamboree cancels and with 2 Jamboree labels affixed. Scott Nos 206-8. 5237 L NEW CALEDONIA (1953) Steamship. Cover franked with Great Britain 1� pence stamp (printed matter rate) tied by unusual straight line date cancel from Noumea, New Caledonia accompanied by Paquebot postmark from "Suffolk." Unusual! 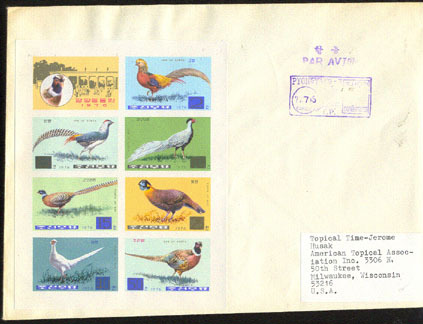 6647 L NORTH KOREA (1976) Pheasants*. Registered airmail letter to US franked with Michel Nos 1500-6 sheetlet. 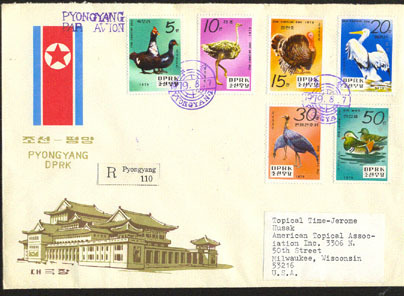 6648 L NORTH KOREA (1976) Pheasants*. Airmail letter to US franked with Michel Nos 1500-6 imperforate sheetlet. 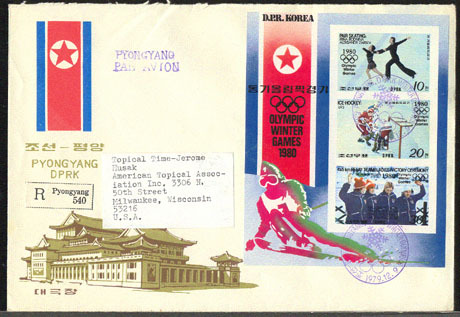 8257 L NORTH KOREA (1976) Gold Medal Winners*. Airmail letter to USA franked with Michel Nos 1537-43 S/S. Montreal Olympics. 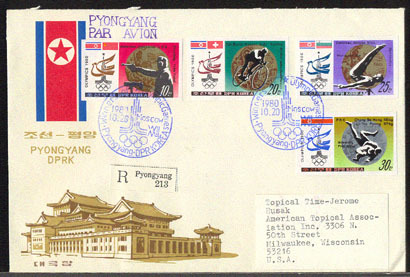 8258 L NORTH KOREA (1976) Olympians*. Registered airmail letter to USA franked with Michel Nos 1508-14 S/S & Block 26. Montreal Olympics. 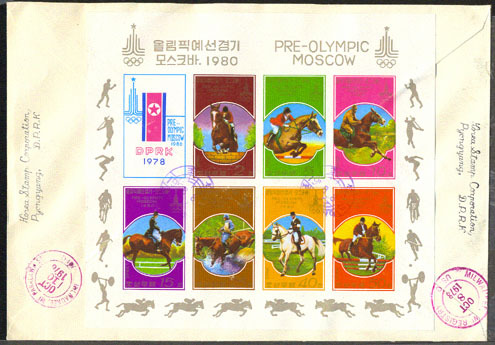 8259 L NORTH KOREA (1976) Gold Medal Winners*. Airmail letter to USA franked with Michel Nos 1516-22 S/S. Montreal Olympics. 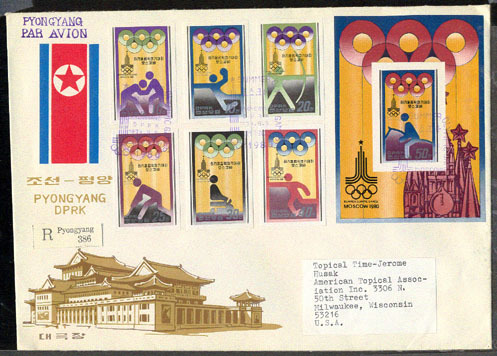 8260 L NORTH KOREA (1976) Gold Medal Winners*. Airmail letter to USA franked with Michel Nos 1516-22 imperforate S/S. Montreal Olympics. 8261 L NORTH KOREA (1976) Olympians*. Airmail letter to USA franked with Michel Nos 1508-14 S/S imperforate. Montreal Olympics. 8496 L NORTH KOREA (1976) Phones*. Telegraphs*. Telecommunications symbols*. Airmail letter to US franked with Michel Nos 1530-5 perforate and imperforate plus Block 295B imperforate. Telephone Centenary. 8497 L NORTH KOREA (1976) Phones*. Telegraphs*. Telecommunications symbols*. Registered airmail letter to US franked with Michel Nos 1530-6 perforate and imperforate Telephone Centenary. 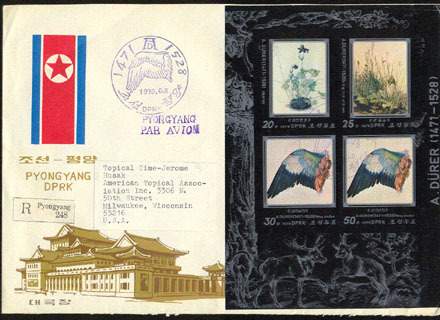 8529 L NORTH KOREA (1976) Birds*. Deer*. Tiger*. Airmail registered cover to USA franked with Michel Nos 1544-9 and Block 31A. Korean embroidery. 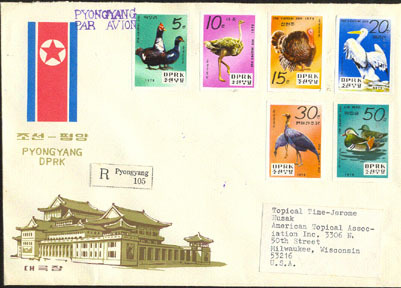 8530 L NORTH KOREA (1976) Birds*. Deer*. Tiger*. Airmail registered cover to USA franked with Michel Nos 1544-50 sheetlet. Korean embroidery. 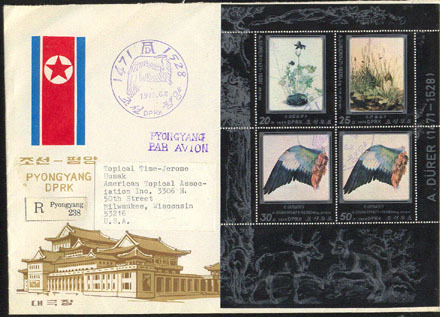 8531 L NORTH KOREA (1976) Birds*. Deer*. Tiger*. Airmail registered cover to USA franked with Michel Nos 1544-50 imperforate sheetlet. Korean embroidery. 8593 L NORTH KOREA (1976) Locomotives*. Airmail letter to US franked with Michel Nos 1555-60 perforate and Block 32B imperforate. 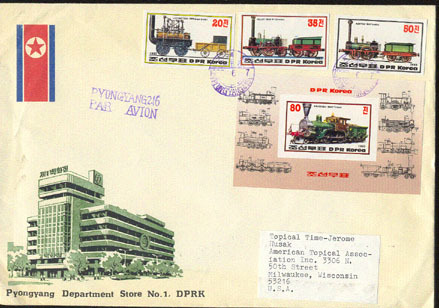 8594 L NORTH KOREA (1976) Locomotives*. Airmail letter to US franked with Michel Nos 1555-61 sheetlet. 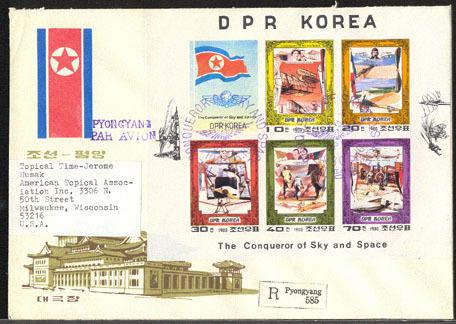 11274 L NORTH KOREA (1976) Satellites*. Airmail letter to US fantastically franked with Michel Nos 1492-7 perforate and imperforate and Block 24B imperforate. 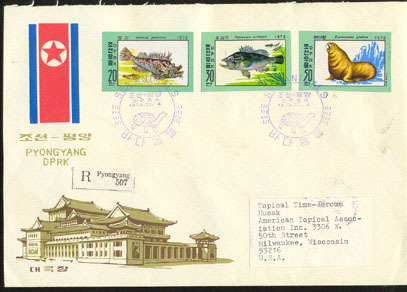 6786 L NORTH KOREA (1977) Butterflies & dragonflies*. Airmail registered cover to USA franked with Michel Nos 1653-8 imperforate. 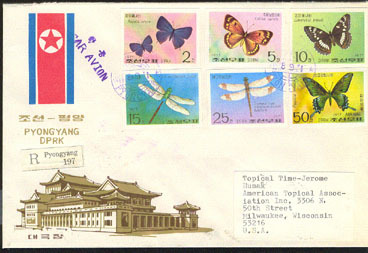 6787 L NORTH KOREA (1977) Butterflies & dragonflies*. Airmail registered cover to USA franked with Michel Nos 1653-8 sheetlet imperforate. 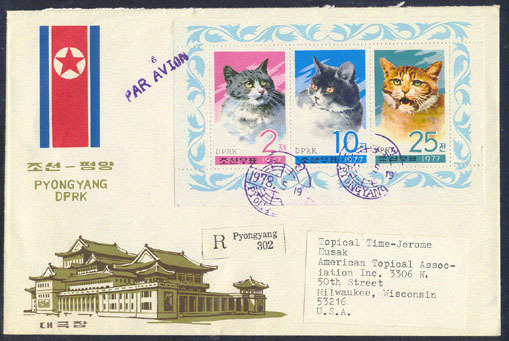 6849 L NORTH KOREA (1977) Cats*. Registered airmail letter to US franked with Michel Nos 1659-61. 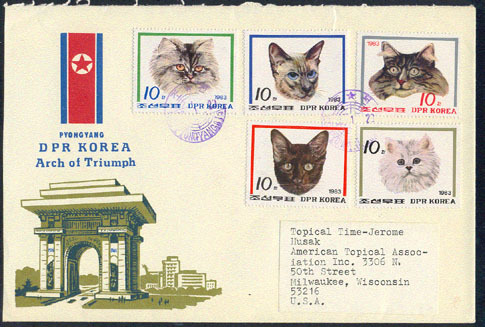 6850 L NORTH KOREA (1977) Cats*. Registered airmail letter to US franked with Michel Nos 1659-61 sheetlet. 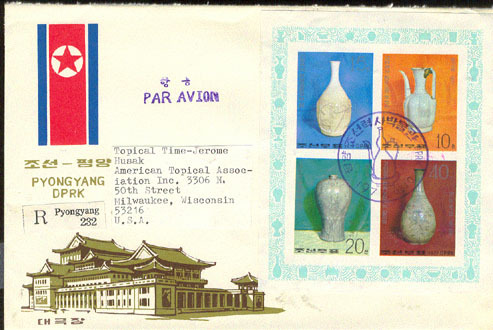 6874 L NORTH KOREA (1977) Porcelain vases*. Airmail envelope to US franked with Michel Nos 1621-4. Nice commemorative cancel! 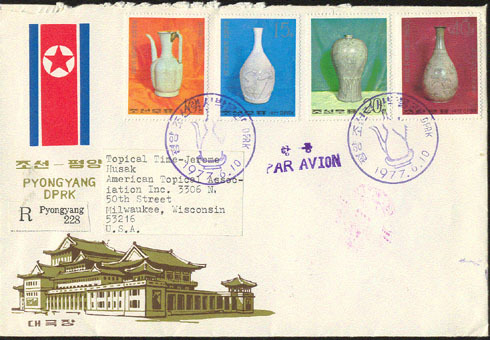 6875 L NORTH KOREA (1977) Porcelain vases*. Airmail envelope to US franked with Michel Nos 1621-4 imperforate. Nice commemorative cancel! 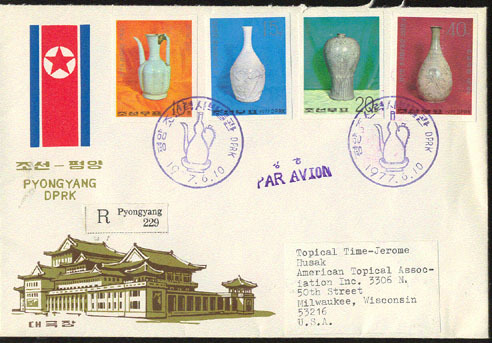 6876 L NORTH KOREA (1977) Porcelain vases*. Airmail envelope to US franked with Michel Nos 1621-4 sheetlet. Nice commemorative cancel! 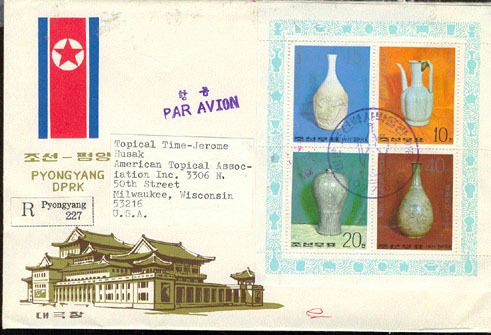 6877 L NORTH KOREA (1977) Porcelain vases*. 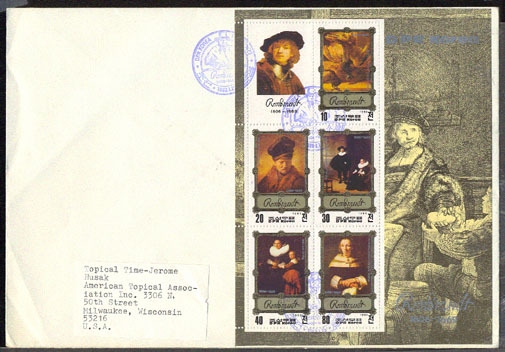 Airmail envelope to US franked with Michel Nos 1621-4 imperforate sheetlet. Nice commemorative cancel! 7028 L NORTH KOREA (1977) Traditional Korean costumes*. 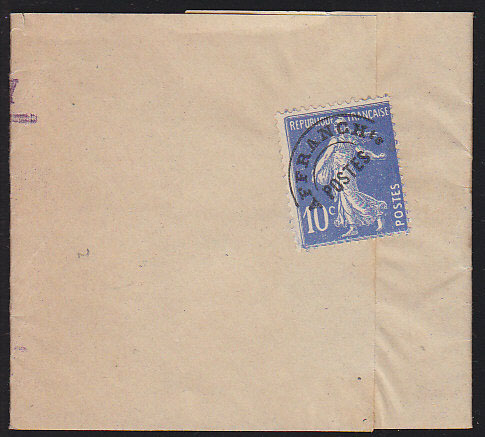 Airmail cover to USA franked with Michel Nos 1601-3 sheetlet. 7029 L NORTH KOREA (1977) Traditional Korean costumes*. Airmail cover to USA franked with Michel Nos 1601-3 imperforate sheetlet. 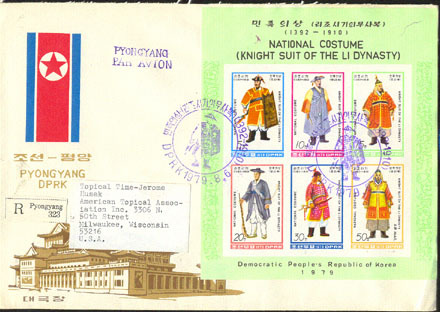 7030 L NORTH KOREA (1977) Traditional Korean costumes*. 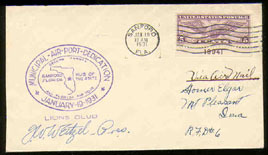 Airmail cover to USA franked with Michel Nos 1601-3. 7031 L NORTH KOREA (1977) Traditional Korean costumes*. Airmail cover to USA franked with Michel Nos 1601-3 imperforate. 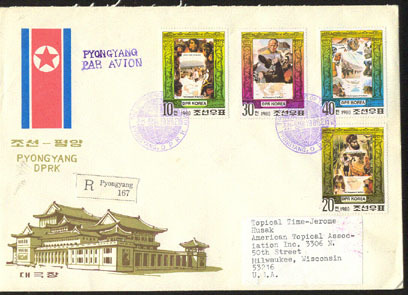 7073 L NORTH KOREA (1977) Dogs*. Registered airmail letter to US franked with Michel Nos 1662-4. 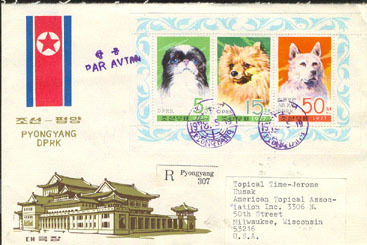 7074 L NORTH KOREA (1977) Dogs*. Registered airmail letter to US franked with Michel Nos 1662-4 imperforate. 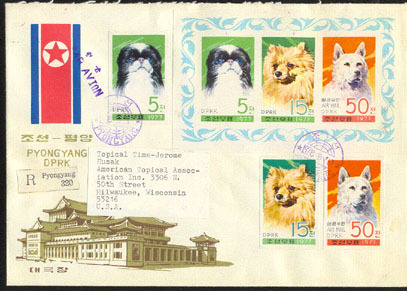 7075 L NORTH KOREA (1977) Dogs*. Registered airmail letter to US franked with Michel Nos 1662-4 imperforate and the imperforate sheetlet of 3. 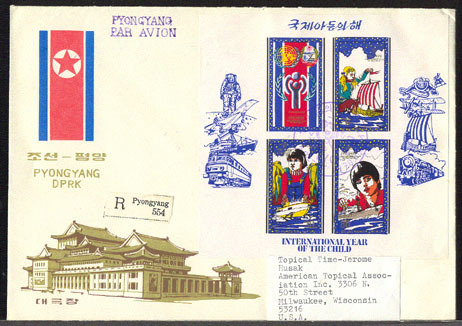 7512 L NORTH KOREA (1977) Cultural artifacts & statuettes*. 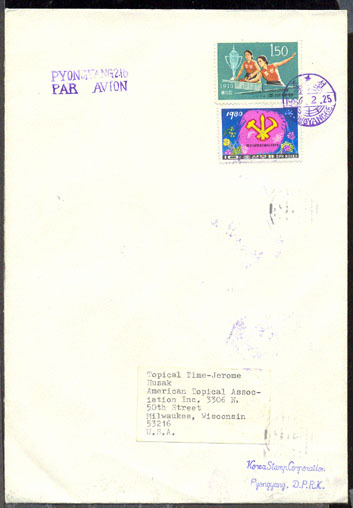 Airmail cover to US franked with Michel Nos 1645-51 sheetlet. 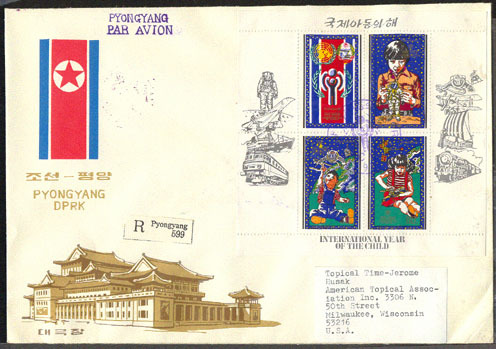 7513 L NORTH KOREA (1977) Cultural artifacts & statuettes*. Airmail cover to US franked with Michel Nos 1645-51 imperforate sheetlet. 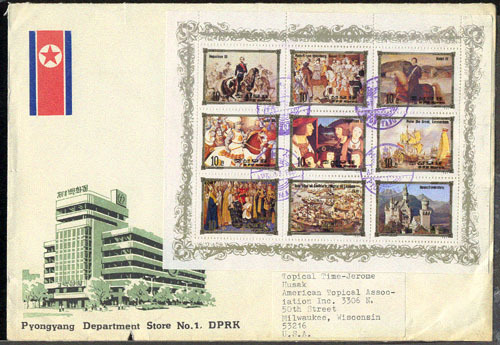 7514 L NORTH KOREA (1977) Cultural artifacts & statuettes*. 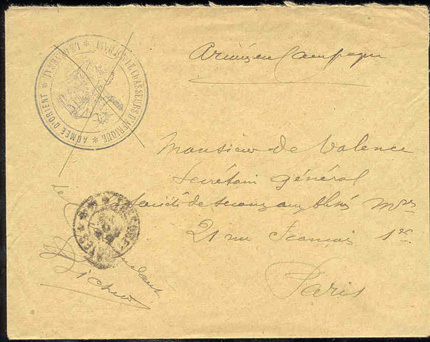 Airmail cover to US franked with Michel Nos 1645-51. 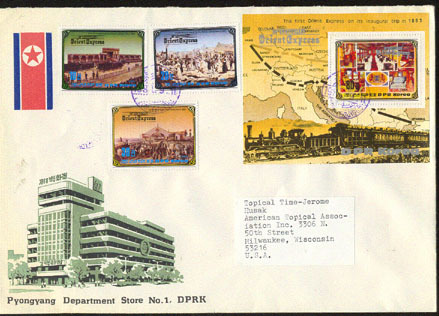 7515 L NORTH KOREA (1977) Cultural artifacts & statuettes*. Airmail cover to US franked with Michel Nos 1645-51 imperforate. 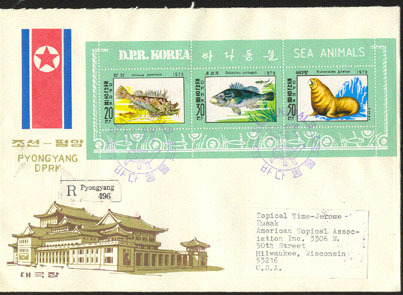 8131 L NORTH KOREA (1977) Molluscs*. Seashell*. Fish*. Registered airmail letter to US franked with Michel Nos 1668-72. 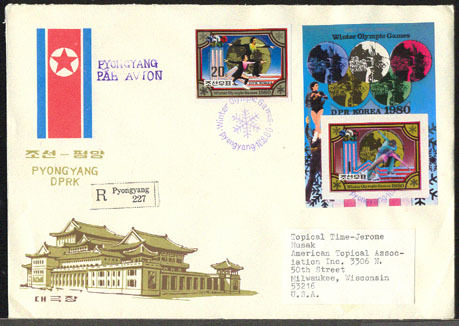 8269 L NORTH KOREA (1977) Gold Medal Winners*. Registered airmail letter to USA franked with Michel Nos C1516-22 S/S & Block C27 (overprinted for Amphilex 77). Montreal Olympics. 6263 L NORTH KOREA (1978) Self-portrait of Rubens*. Registered airmail letter to USA franked with Michel No 1704 block of 4 S/S. 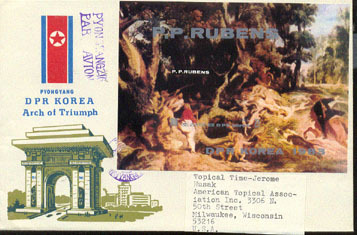 6264 L NORTH KOREA (1978) Self-portrait of Rubens*. Registered airmail letter to USA franked with Michel No 1704 block of 4 S/S imperforate. 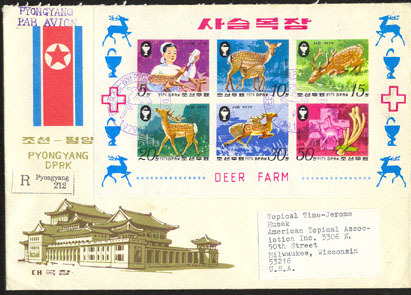 6078 L NORTH KOREA (1979) Deer*. Airmail registered cover to USA franked with Michel Nos 1898-1903. 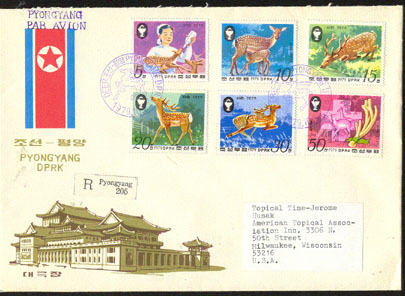 6079 L NORTH KOREA (1979) Deer*. Airmail registered cover to USA franked with Michel Nos 1898-1903 imperforate. 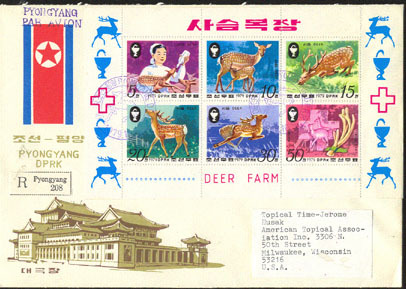 6080 L NORTH KOREA (1979) Deer*. Airmail registered cover to USA franked with Michel Nos 1898-1903 sheetlet. 6081 L NORTH KOREA (1979) Deer*. Airmail registered cover to USA franked with Michel Nos 1898-1903 imperforate sheetlet. 6265 L NORTH KOREA (1979) Akelei*. Grass*. Wing of bird*. 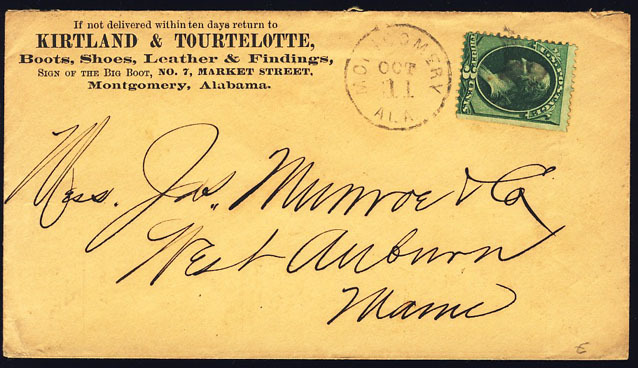 Airmail registered cover to USA franked with Michel Nos 1854-7 sheetlet and nice wing cancel. Paintings of Durer. 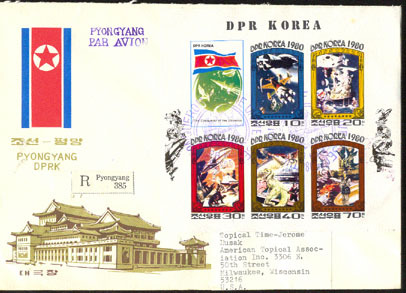 6266 L NORTH KOREA (1979) Akelei*. Grass*. Wing of bird*. Airmail registered cover to USA franked with Michel Nos 1854-7 imperforate sheetlet and nice wing cancel. Paintings of Durer. 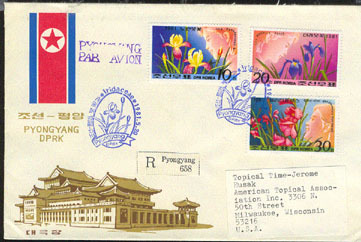 6267 L NORTH KOREA (1979) Akelei*. Grass*. Wing of bird*. Airmail registered cover to USA franked with Michel Nos 1854-7 imperforate and nice wing cancel. 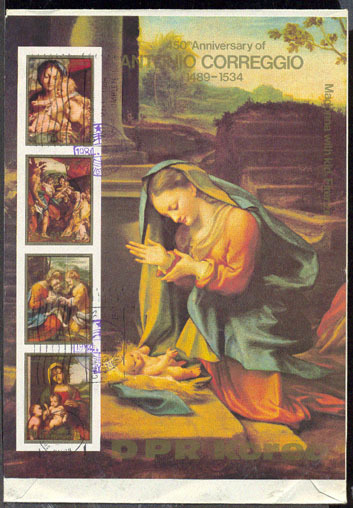 Paintings of Durer. 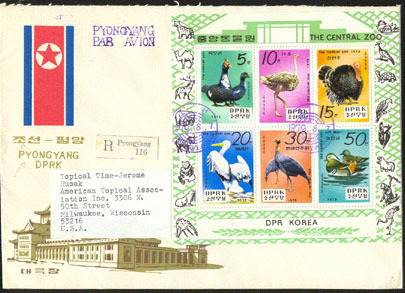 6653 L NORTH KOREA (1979) Various birds of Central Zoo*. Airmail registered cover to USA franked with Michel Nos 1905-10. 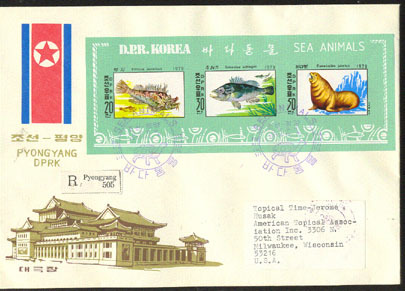 6654 L NORTH KOREA (1979) Various birds of Central Zoo*. Airmail registered cover to USA franked with Michel Nos 1905-10 imperforate. 6655 L NORTH KOREA (1979) Various birds of Central Zoo*. Airmail registered cover to USA franked with Michel Nos 1905-10 sheetlet. 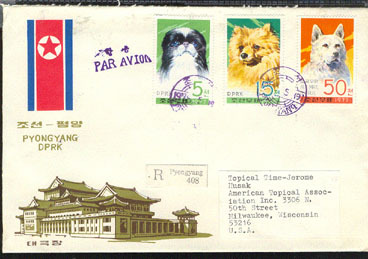 6656 L NORTH KOREA (1979) Various birds of Central Zoo*. Airmail registered cover to USA franked with Michel Nos 1905-10 imperforate sheetlet. 6897 L NORTH KOREA (1979) Children*. Train*. Ship*. Registered airmail letter to USA franked with Michel Blocks 63 & 66. 6898 L NORTH KOREA (1979) Children*. Train*. Ship*. Registered airmail letter to USA franked with Michel Blocks 63 & 66 imperforate. 6899 L NORTH KOREA (1979) Children*. Astronauts*. Registered airmail letter to USA franked with Michel Nos 1915,1919 & 1923 S/S. 6900 L NORTH KOREA (1979) Children*. Astronauts*. Registered airmail letter to USA franked with Michel Nos 1915,1919 & 1923 S/S imperforate. 6901 L NORTH KOREA (1979) Children*. Ships*. Registered airmail letter to USA franked with Michel Nos 1916,1920 & 1924 S/S. 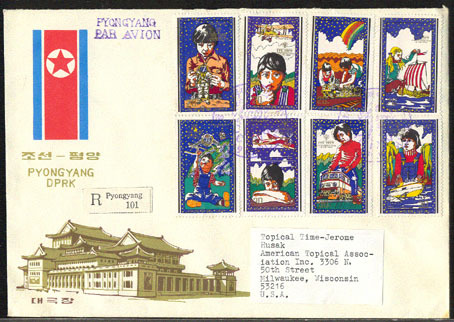 6902 L NORTH KOREA (1979) Children*. Ships*. Registered airmail letter to USA franked with Michel Nos 1916,1920 & 1924 S/S imperforate. 6903 L NORTH KOREA (1979) Children*. Trains*. Registered airmail letter to USA franked with Michel Nos 1913,1917 & 1921 S/S. 6904 L NORTH KOREA (1979) Children*. Trains*. Registered airmail letter to USA franked with Michel Nos 1913,1917 & 1921 S/S. imperforate. 6905 L NORTH KOREA (1979) Children*. Trains*. Ships*. Astronauts*. Concorde*. Registered airmail letter to USA franked with Michel Nos 1913-20. 6906 L NORTH KOREA (1979) Children*. Trains*. Ships*. Astronauts*. Concorde*. Registered airmail letter to USA franked with Michel Nos 1913-20 imperforate. 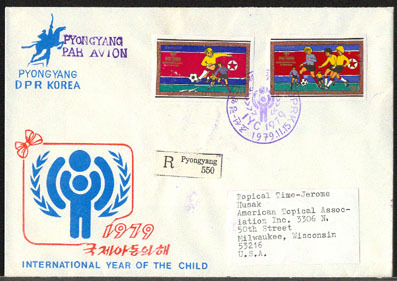 6907 L NORTH KOREA (1979) Children playing soccer*. 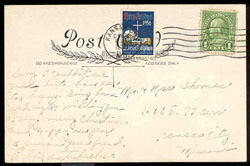 Registered airmail letter to USA franked with Michel Nos 1933-5 S/S. 6908 L NORTH KOREA (1979) Children playing soccer*. Registered airmail letter to USA franked with Michel Nos 1933-5 S/S imperforate. 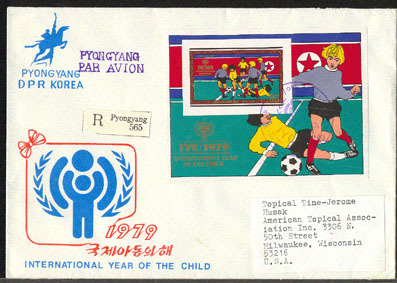 6909 L NORTH KOREA (1979) Children playing soccer*. Registered airmail letter to USA franked with Michel Nos 1933-4. 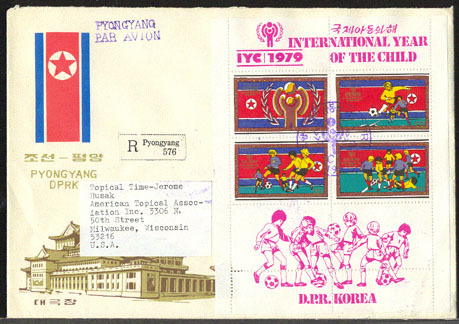 6910 L NORTH KOREA (1979) Children playing soccer*. Registered airmail letter to USA franked with Michel Nos 1933-4 imperforate. 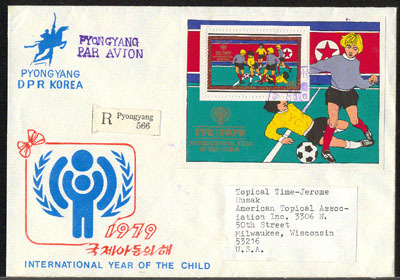 6911 L NORTH KOREA (1979) Children playing soccer*. Registered airmail letter to USA franked with Michel Block 67. 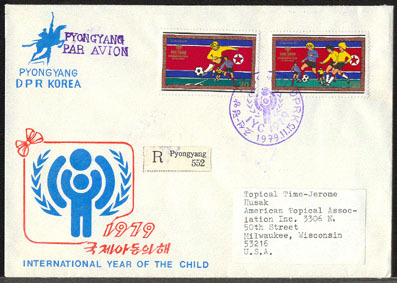 6912 L NORTH KOREA (1979) Children playing soccer*. Registered airmail letter to USA franked with Michel Block 67 imperforate. 7032 L NORTH KOREA (1979) Traditional Korean costumes*. 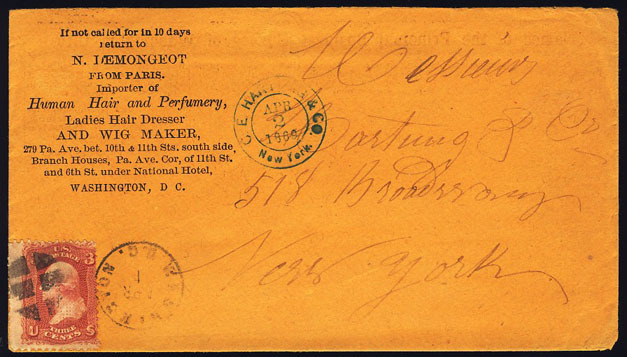 Airmail registered cover to USA franked with Michel Nos 1874-9 sheetlet. 7033 L NORTH KOREA (1979) Traditional Korean costumes*. Airmail registered cover to USA franked with Michel Nos 1874-9 imperforate sheetlet. 7034 L NORTH KOREA (1979) Traditional Korean costumes*. 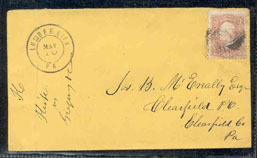 Airmail registered cover to USA franked with Michel Nos 1874-9. 7035 L NORTH KOREA (1979) Traditional Korean costumes*. Airmail registered cover to USA franked with Michel Nos 1874-9 imperforate. 7240 L NORTH KOREA (1979) Devil Stinger*. Juvenile rockfish*. Stellar sea lion*. 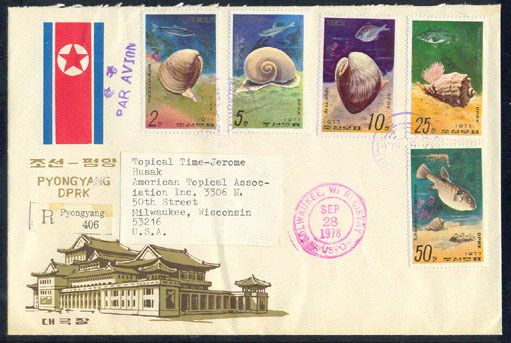 Airmail registered cover to USA franked with Michel Nos 1937-9 and canceled with lovely turtle cancel. 7241 L NORTH KOREA (1979) Devil Stinger*. Juvenile rockfish*. Stellar sea lion*. Airmail registered cover to USA franked with Michel Nos 1937-9 imperforate and canceled with lovely turtle cancel. 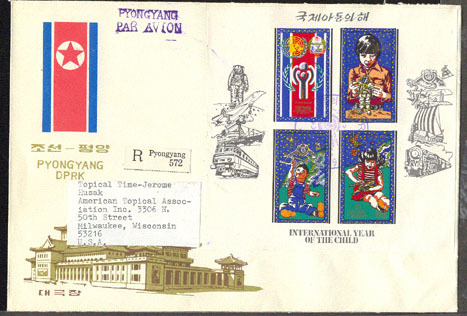 7242 L NORTH KOREA (1979) Devil Stinger*. Juvenile rockfish*. Stellar sea lion*. Airmail registered cover to USA franked with Michel Nos 1937-9 sheetlet and canceled with lovely turtle cancel. 7243 L NORTH KOREA (1979) Devil Stinger*. Juvenile rockfish*. Stellar sea lion*. Airmail registered cover to USA franked with Michel Nos 1937-9 sheetlet imperforate and canceled with lovely turtle cancel. 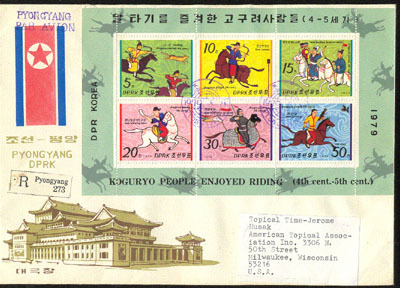 7453 L NORTH KOREA (1979) Various activities on horseback from ancient times*. Bow hunting with dog*. Beating drums*. Horn*. Hawk hunting*. Man in armor*. Airmail registered cover to USA franked with Michel Nos 1898-1903. 7454 L NORTH KOREA (1979) Various activities on horseback from ancient times*. Bow hunting with dog*. Beating drums*. Horn*. Hawk hunting*. Man in armor*. Airmail registered cover to USA franked with Michel Nos 1898-1903 imperforate. 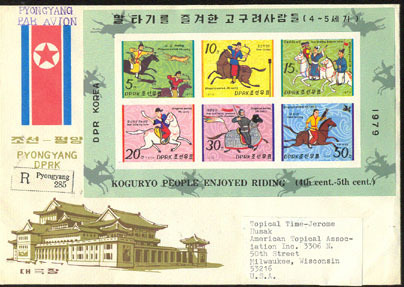 7455 L NORTH KOREA (1979) Various activities on horseback from ancient times*. Bow hunting with dog*. Beating drums*. Horn*. Hawk hunting*. Man in armor*. Airmail registered cover to USA franked with Michel Nos 1898-1903 sheetlet. 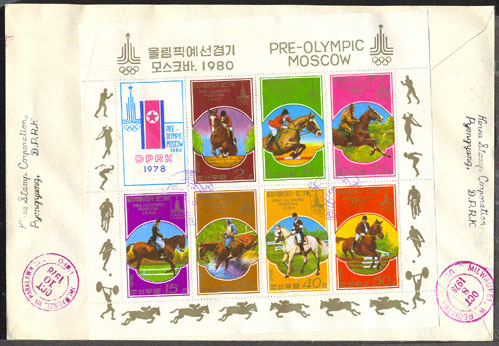 7456 L NORTH KOREA (1979) Various activities on horseback from ancient times*. Bow hunting with dog*. Beating drums*. Horn*. Hawk hunting*. Man in armor*. Airmail registered cover to USA franked with Michel Nos 1898-1903 imperforate sheetlet. 8272 L NORTH KOREA (1979) Stylized Olympian athletes*. Registered airmail letter to USA franked with Michel Nos 1890-6 imperforate S/S. Moscow Olympics. 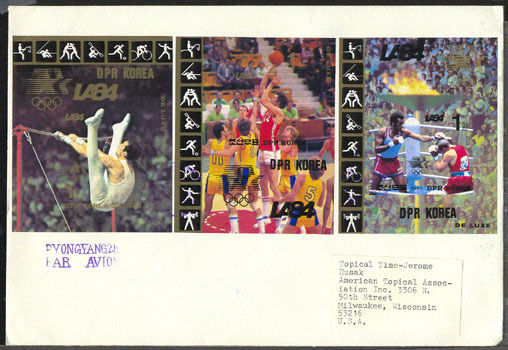 8273 L NORTH KOREA (1979) Stylized Olympian athletes*. Registered airmail letter to USA franked with Michel Nos 1890-5 & Block 62 imperforate. Moscow Olympics. 8297 L NORTH KOREA (1979) Skaters*. Hockey*. Relay team*. 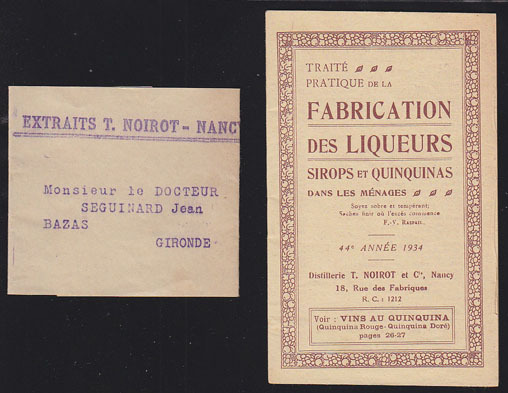 Registered airmail cover sent to USA franked with Michel Nos 1941-3 S/S. Lake Placid Olympics. 8298 L NORTH KOREA (1979) Skaters*. Hockey*. Relay team*. Registered airmail cover sent to USA franked with Michel Nos 1941-3 imperforate S/S. Lake Placid Olympics. 8299 L NORTH KOREA (1979) Skaters*. Skiers*. Hockey*. Relay team*. 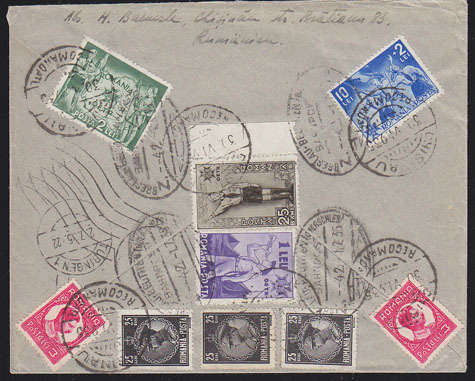 Registered airmail cover sent to USA franked with Michel Nos 1941-5. Lake Placid Olympics. 8300 L NORTH KOREA (1979) Skaters*. Skiers*. Hockey*. Relay team*. Registered airmail cover sent to USA franked with Michel Nos 1941-5 imperforate. Lake Placid Olympics. 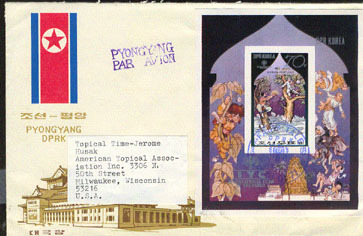 8301 L NORTH KOREA (1979) Ice dancing*. 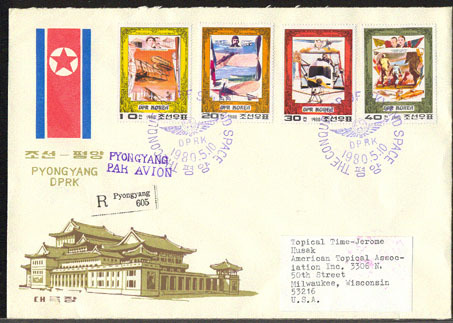 Registered airmail cover sent to USA franked with Michel Block 68. Lake Placid Olympics. 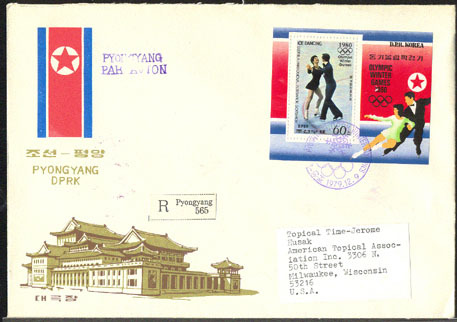 8302 L NORTH KOREA (1979) Ice dancing*. 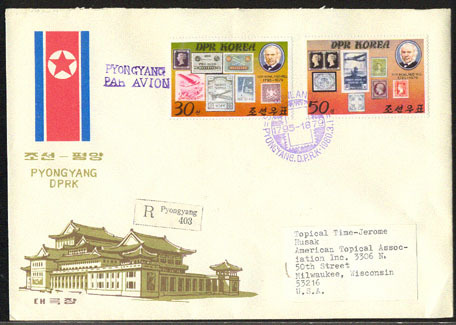 Registered airmail cover sent to USA franked with Michel Block 68 imperforate. Lake Placid Olympics. 8303 L NORTH KOREA (1979) Skaters*. Ice dancing*. Skier*. 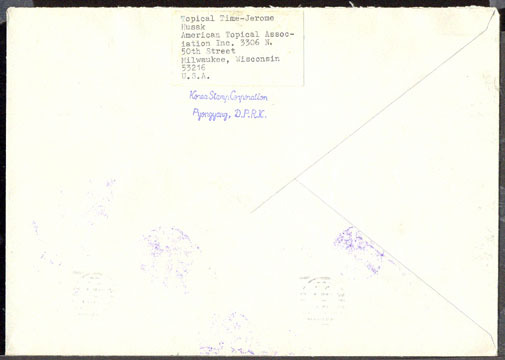 Registered airmail cover sent to USA franked with Michel Nos 1944-6 S/S. Lake Placid Olympics. 8304 L NORTH KOREA (1979) Skaters*. Ice dancing*. Skier*. 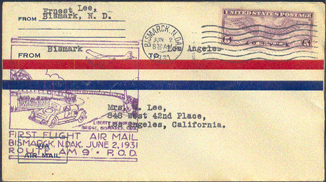 Registered airmail cover sent to USA franked with Michel Nos 1944-6 imperforate S/S. Lake Placid Olympics. 6269 L NORTH KOREA (1980) Painting by Durer*. Registered airmail letter to USA franked with Michel Nos 2041-2 S/S. 6270 L NORTH KOREA (1980) Painting by Durer*. Registered airmail letter to USA franked with Michel Nos 2041-2 S/S imperforate. 6271 L NORTH KOREA (1980) Painting by Durer*. Registered airmail letter to USA franked with Michel No 2041 & Block 81. 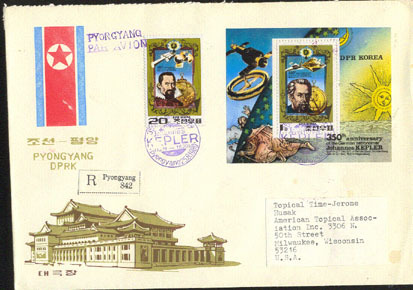 6380 L NORTH KOREA (1980) Kepler*. Spacecraft*. Airmail registered cover to USA franked with Michel Block 82A. 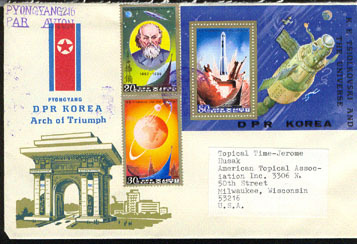 6381 L NORTH KOREA (1980) Kepler*. Spacecraft*. Airmail registered cover to USA franked with Michel Block 82B imperforate. 6382 L NORTH KOREA (1980) Kepler*. Spacecraft*. 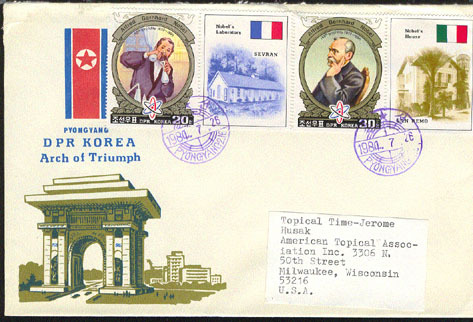 Airmail registered cover to USA franked with Michel No 2044 and sheetlet. 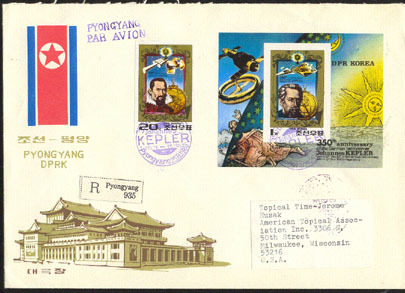 6383 L NORTH KOREA (1980) Kepler*. Spacecraft*. 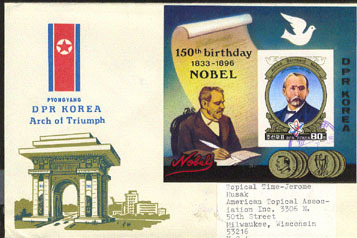 Airmail registered cover to USA franked with Michel No 2044 and sheetlet imperforate. 6512 L NORTH KOREA (1980) Various planes*. Registered airmail letter to USA franked with Michel Nos 1997-2000. Aviation & space pioneers. 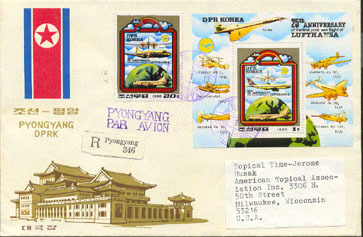 6513 L NORTH KOREA (1980) Various planes*. 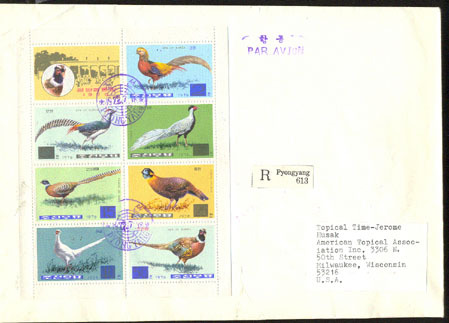 Registered airmail letter to USA franked with Michel Nos 1997-2000 imperforate. Aviation & space pioneers. 6514 L NORTH KOREA (1980) Various planes*. Registered airmail letter to USA franked with Michel Nos 1997-2001 S/S. 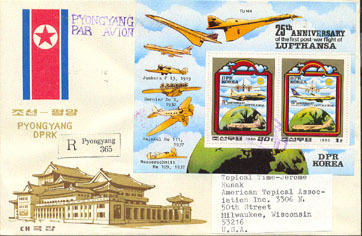 6515 L NORTH KOREA (1980) Various planes*. 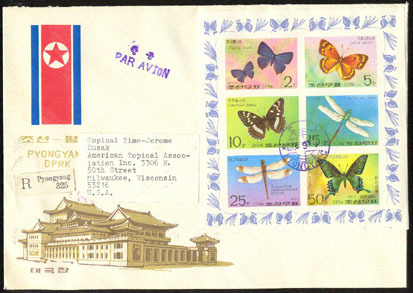 Registered airmail letter to USA franked with Michel Nos 1997-2001 S/S imperforate. 6516 L NORTH KOREA (1980) Various aircraft*. Registered airmail letter to US franked with Michel Nos 2062-3. 25th anniversary of Lufthansa. 6517 L NORTH KOREA (1980) Various aircraft*. Registered airmail letter to US franked with Michel No 2062-3 imperforate. 25th anniversary of Lufthansa. 6518 L NORTH KOREA (1980) Various aircraft*. Registered airmail letter to US franked with Michel Block 85A. 25th anniversary of Lufthansa. 6519 L NORTH KOREA (1980) Various aircraft*. Registered airmail letter to US franked with Michel Block 85B imperforate. 25th anniversary of Lufthansa. 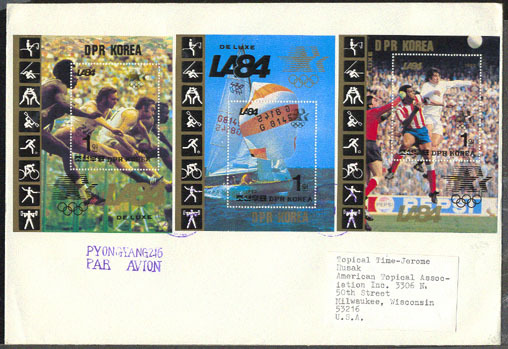 7180 L NORTH KOREA (1980) Balboa*. Hillary*. Tenzing*. Tazieff*. Orellana*. 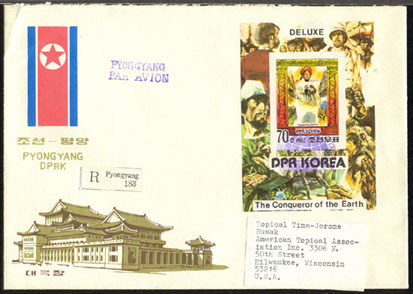 Airmail registered cover to USA franked with Conquerors of the Earth series: Michel Nos 1966-9. Everyone has heard of Balboa, Hillary & Tenzing. Tazieff wasa famous vulcanologist. Orellana was the first European to travel the length of the Amazon River. 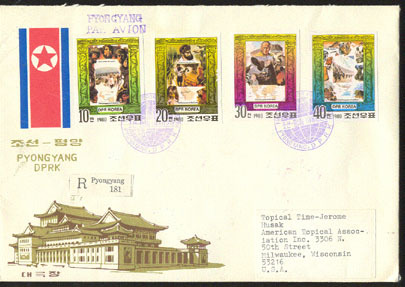 7181 L NORTH KOREA (1980) Balboa*. Hillary*. Tenzing*. Tazieff*. Orellana*. 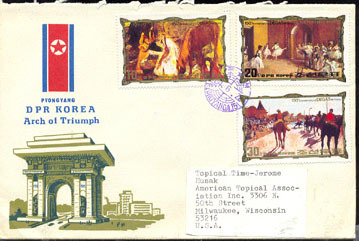 Airmail registered cover to USA franked with Conquerors of the Earth series: Michel Nos 1966-9 imperforate. Tazieff was a famous vulcanologist. Orellana wasthe first European to travel the length of the Amazon River. 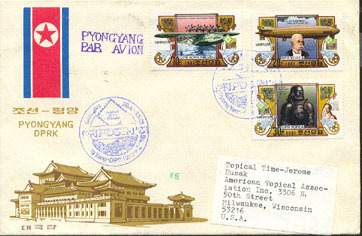 7182 L NORTH KOREA (1980) Balboa*. Hillary*. Tenzing*. Tazieff*. Orellana*. Ibn Batutta*. 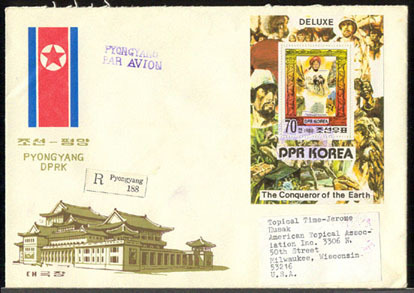 Airmail registered cover to USA franked with Conquerors of the Earth series: Michel Nos 1966-70 sheetlet. Tazieff was a famous vulcanologist. Orellana was the first European to travel the length of the Amazon River. Battuta was a 14th century explorer who traveled the Muslim world in the Middle East and Africa. 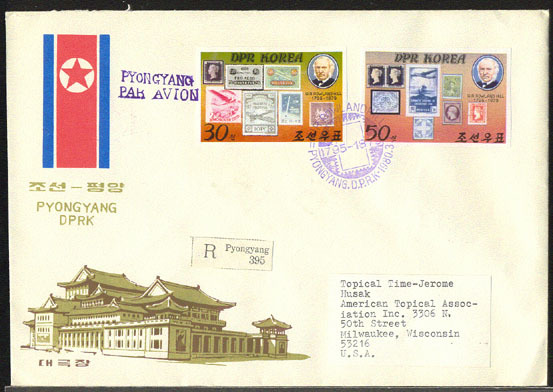 7183 L NORTH KOREA (1980) Balboa*. Hillary*. Tenzing*. Tazieff*. Orellana*. Ibn Battuta*. 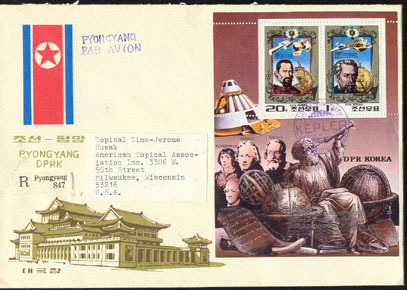 Airmail registered cover to USA franked with Conquerors of the Earth series: Michel Nos 1966-70 sheetlet imperforate. Tazieff was a famous vulcanologist. Orellana was the first European to travel the length of the Amazon River. Battuta was a 14th century explorer who traveled the Muslim world in the Middle East and Africa. 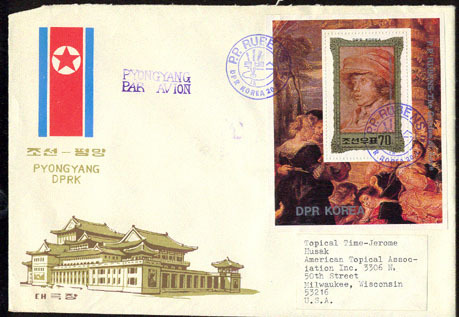 7184 L NORTH KOREA (1980) Ibn Battuta*. Airmail registered cover to USA franked with Michel Block 70A. Battuta was a 14th century Moslem geographer who traveled the Sahara. 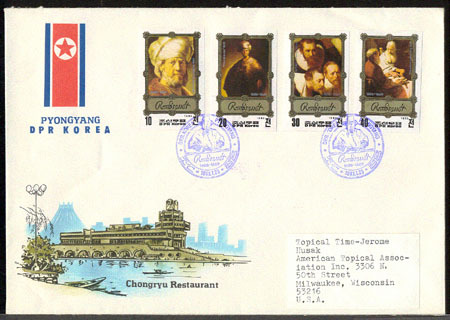 7185 L NORTH KOREA (1980) Ibn Battuta*. Airmail registered cover to USA franked with Michel Block 70B imperforate. Battuta was a 14th century geographer who traveled the Sahara. 7794 L NORTH KOREA (1980) Robert Stolz*. 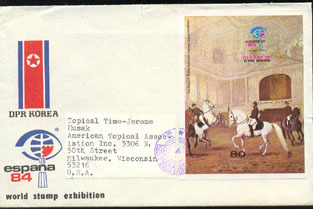 Airmail cover to USA franked with Michel Nos 2077-8 imperforate. 100th anniversary of birth of Austrian composer. 8019 L NORTH KOREA (1980) Nurses*. 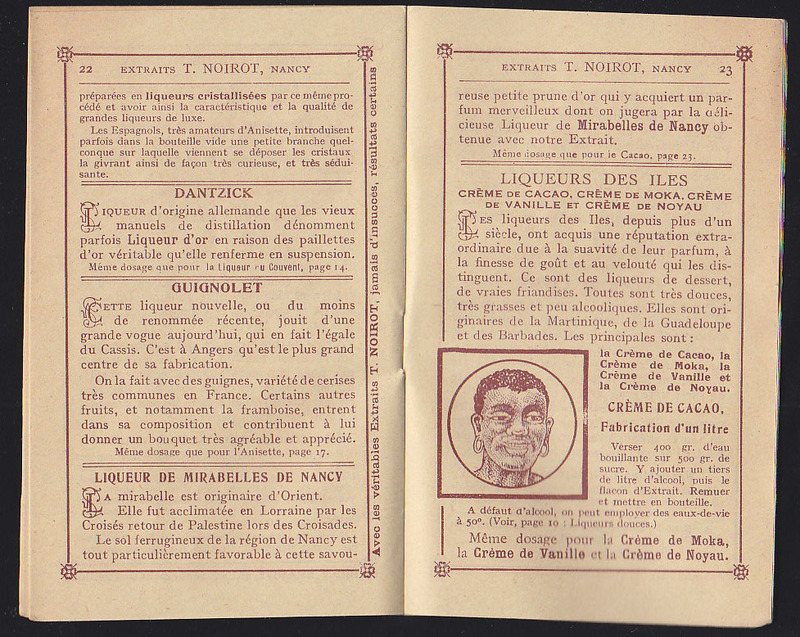 Dunant*. Red Cross*. 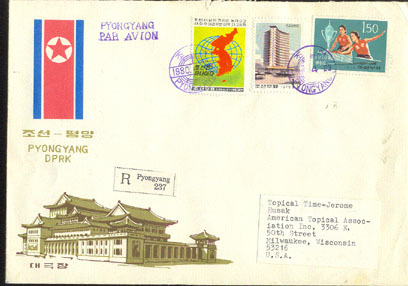 Airmail registered cover to USA franked with Michel Nos 1976-82. 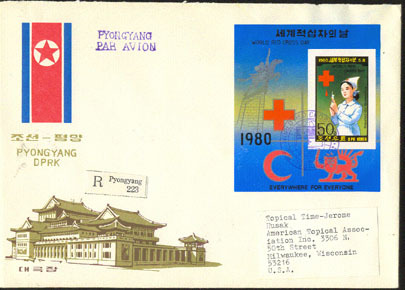 8020 L NORTH KOREA (1980) Nurses*. Dunant*. Red Cross*. 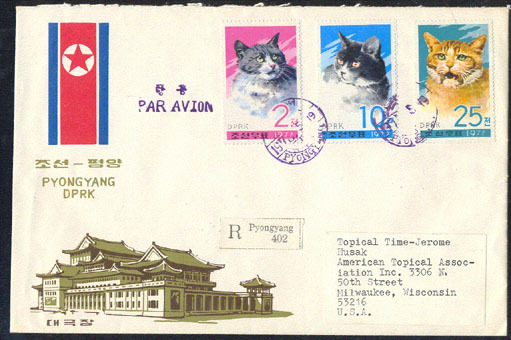 Airmail registered cover to USA franked with Michel Nos 1976-82 imperforate. 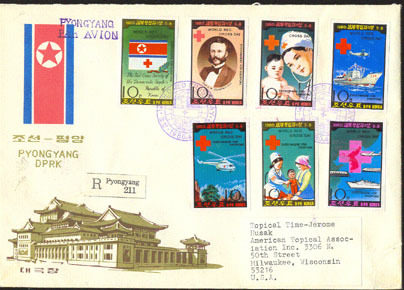 8022 L NORTH KOREA (1980) Nurses*. Dunant*. Red Cross*. Airmail registered cover to USA franked with Michel Block 71A. 8023 L NORTH KOREA (1980) Nurses*. Dunant*. Red Cross*. Airmail registered cover to USA franked with Michel Block 71B imperforate. 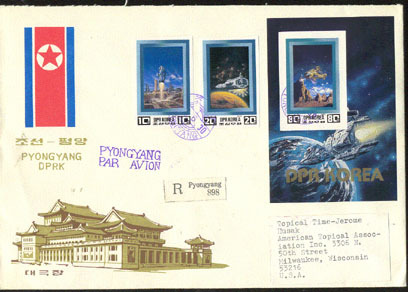 8195 L NORTH KOREA (1980) Spacecraft*. Dinosaurs*. 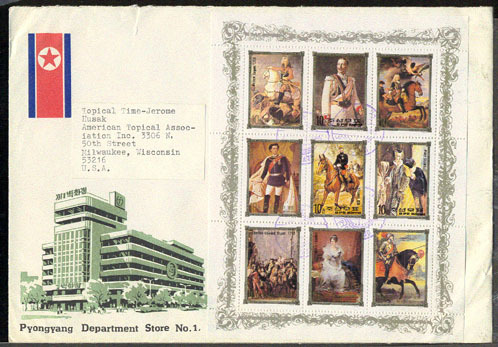 Airmail registered cover to USA franked with Michel Nos 2003-6 imperforate sheetlet. 8274 L NORTH KOREA (1980) Olympic Winners*. Registered airmail letter to USA franked with Michel Nos 2052-5 imperforate. Moscow Olympics. 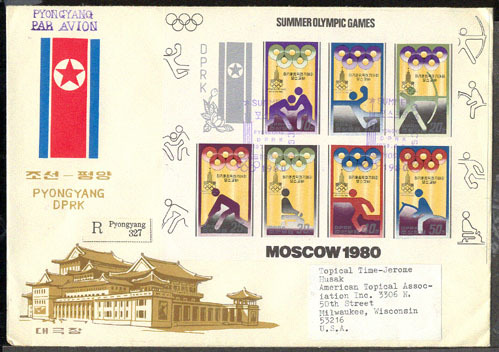 8275 L NORTH KOREA (1980) Olympic Winners*. Grecian Horseman*. Airmail letter to USA franked with unlisted 70ch S/S (seems to be in the same series as Michel Nos 1881-8). Moscow Olympics. 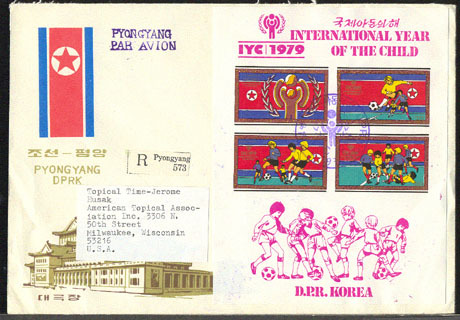 8276 L NORTH KOREA (1980) Olympic Winners*. Grecian Horseman*. Airmail letter to USA franked with unlisted 70ch imperforate S/S (seems to be in the same series as Michel Nos 1881-8). Moscow Olympics. 8305 L NORTH KOREA (1980) Skaters*. Gold medal winners*. 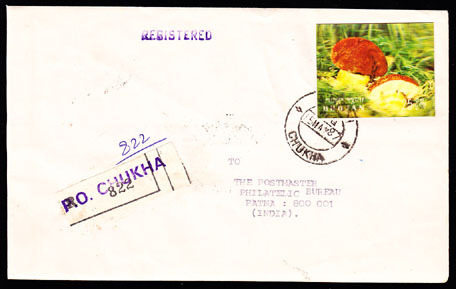 Registered airmail cover sent to USA franked with Michel No 2038 & Block 80. Lake Placid Olympics. 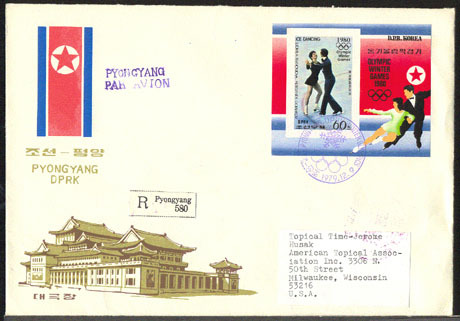 8306 L NORTH KOREA (1980) Skaters*. Gold medal winners*. 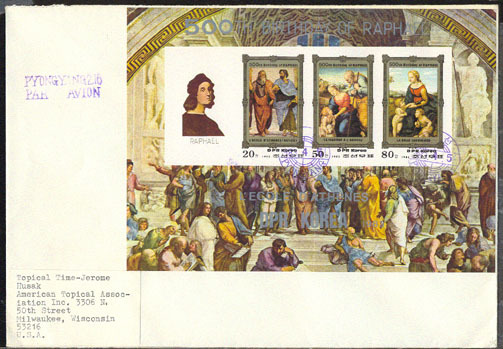 Registered airmail cover sent to USA franked with Michel No 2038 & Block 80 imperforate. Lake Placid Olympics. 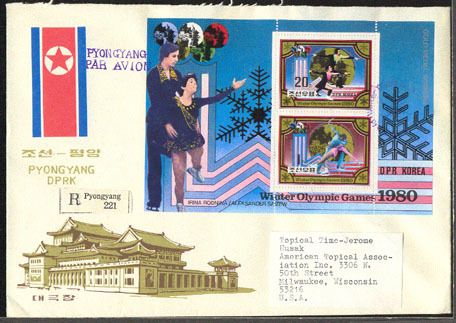 8307 L NORTH KOREA (1980) Skaters*. Gold medal winners*. Registered airmail cover sent to USA franked with Michel Nos 2039 & 2039 sheetlet. Lake Placid Olympics. 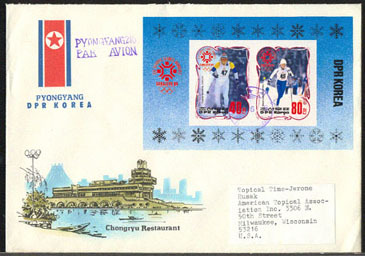 8308 L NORTH KOREA (1980) Skaters*. Gold medal winners*. 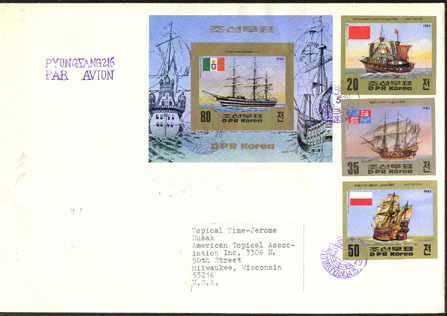 Registered airmail cover sent to USA franked with Michel Nos 2039 & 2039 imperforate sheetlet. Lake Placid Olympics. 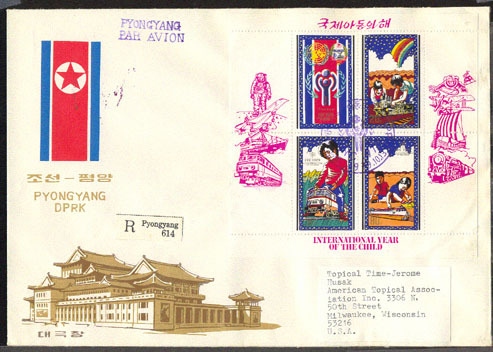 8424 L NORTH KOREA (1980) Rowland Hill*. Various stamps*. Registered airmail letter to USA franked with Michel Nos 1973-4. 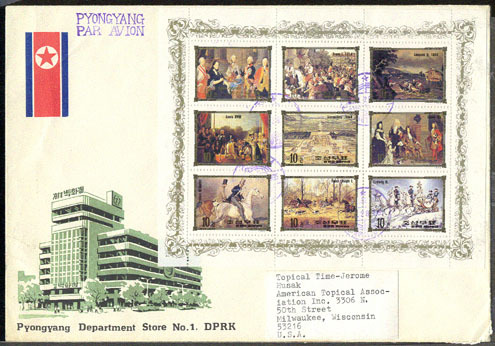 8425 L NORTH KOREA (1980) Various stamps*. Registered airmail letter to USA franked with Michel Nos 2047-9. Essen Exhibition. 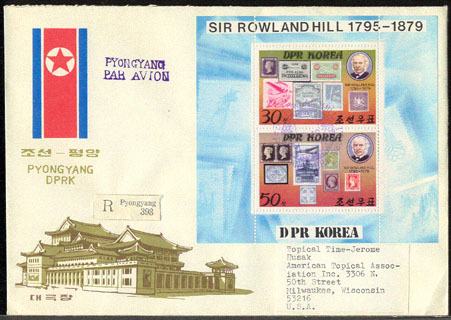 8426 L NORTH KOREA (1980) Rowland Hill*. 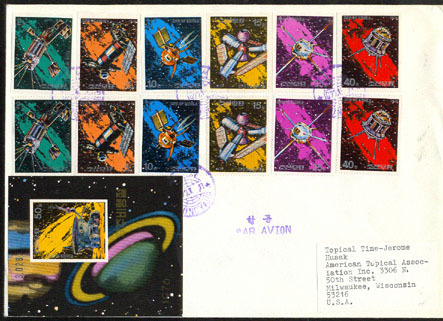 Various stamps*. Registered airmail letter to USA franked with Michel Nos 1973-4 imperforate. 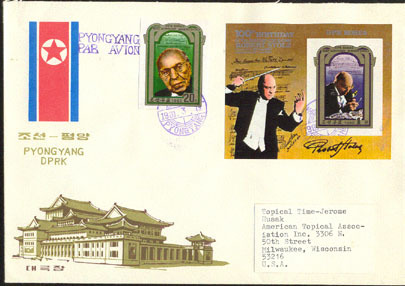 8427 L NORTH KOREA (1980) Rowland Hill*. 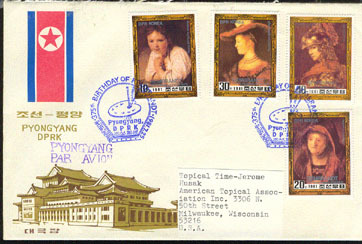 Various stamps*. 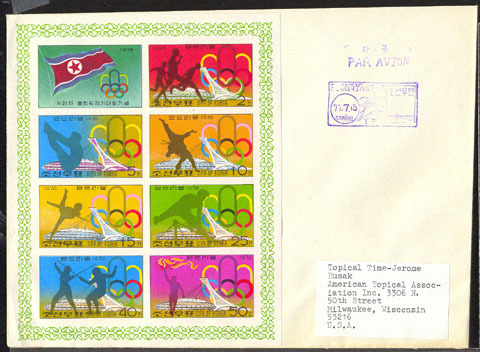 Registered airmail letter to USA franked with Michel Nos 1973-4 S/S. 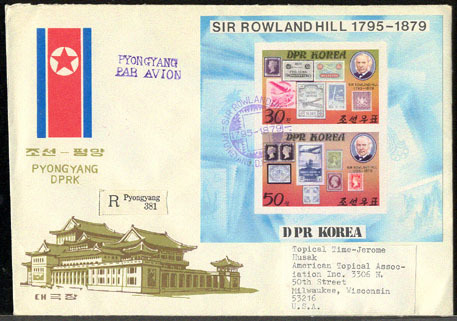 8428 L NORTH KOREA (1980) Rowland Hill*. 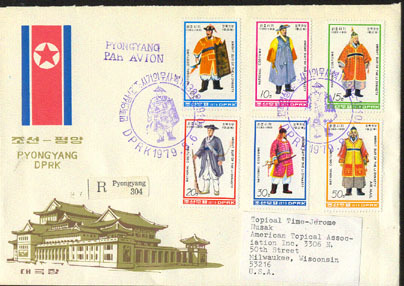 Various stamps*. 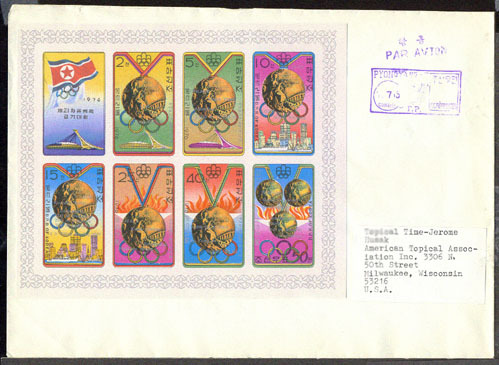 Registered airmail letter to USA franked with Michel Nos 1973-4 S/S imperforate. 8596 L NORTH KOREA (1980) Train*. Airmail registered cover to USA franked with Michel Nos 2065-6. 150th anniversary of Liverpool-Manchester line. 8597 L NORTH KOREA (1980) Train*. Airmail registered cover to USA franked with Michel Nos 2065-6 imperforate. 150th anniversary of Liverpool-Manchester line. 8598 L NORTH KOREA (1980) Train*. 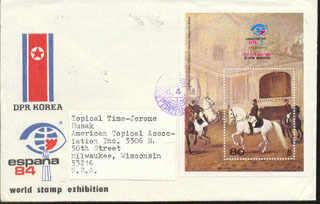 Airmail registered cover to USA franked with Michel Block 86A. 150th anniversary of Liverpool-Manchester line. 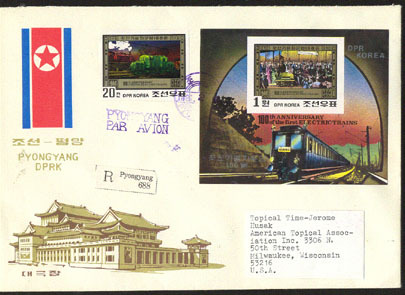 8599 L NORTH KOREA (1980) Train*. 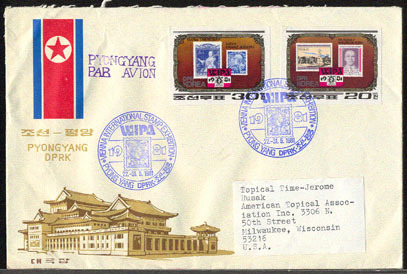 Airmail registered cover to USA franked with Michel Block 86B imperforate. 150th anniversary of Liverpool-Manchester line. 8600 L NORTH KOREA (1980) Train*. Airmail registered cover to USA franked with Michel Nos 2068-9. 100th anniversary of electric trains. 8601 L NORTH KOREA (1980) Train*. 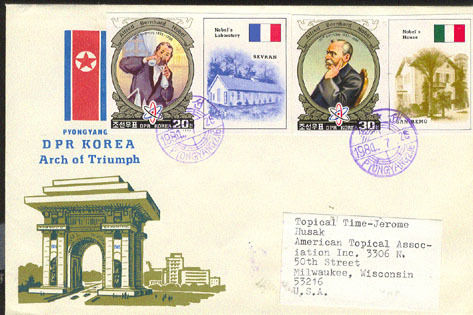 Airmail registered cover to USA franked with Michel Nos 2068-9 imperforate. 100th anniversary of electric trains. 8602 L NORTH KOREA (1980) Train*. Airmail registered cover to USA franked with Michel Block 87A. 100th anniversary of electric trains. 8603 L NORTH KOREA (1980) Train*. 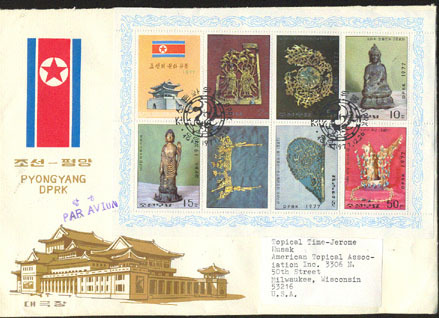 Airmail registered cover to USA franked with Michel Nos Block 87A imperforate. 100th anniversary of electric trains. 8805 L NORTH KOREA (1980) Tito*. Registered airmail letter to US franked with Michel No 2061. 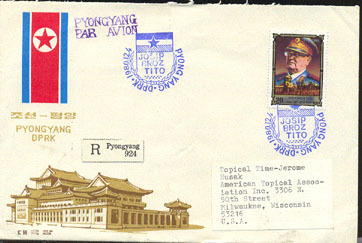 8806 L NORTH KOREA (1980) Tito*. Registered airmail letter to US franked with Michel No 2061 imperforate. 6274 L NORTH KOREA (1981) Paintings by Rubens*. Airmail letter to USA franked with Michel Nos 2166-71. 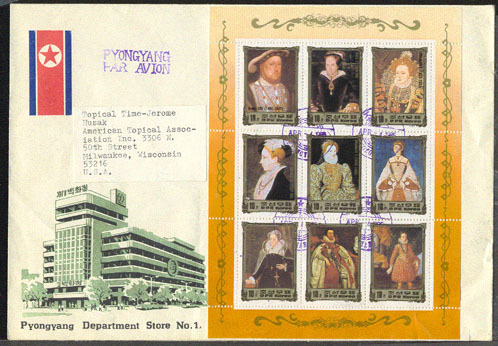 Roughly opened at top but stamps appear undamaged. 6275 L NORTH KOREA (1981) Paintings by Rubens*. Airmail letter to USA franked with Michel Nos 2166-71. imperforate. 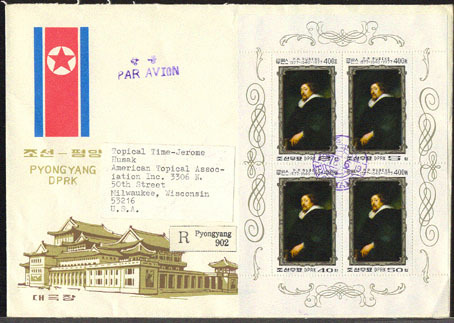 6276 L NORTH KOREA (1981) Paintings by Rembrandt*. Airmail letter to US franked with Michel Nos 2145-8 and nice palette cancel. 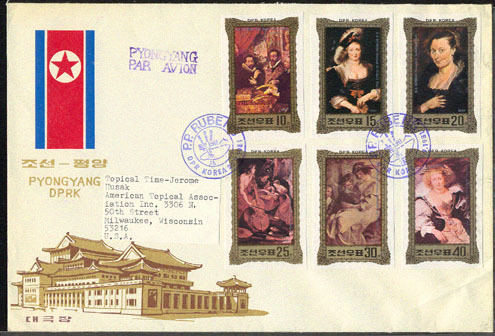 6277 L NORTH KOREA (1981) Paintings by Rembrandt*. Airmail letter to US franked with Michel Nos 2145-8 imperforate and nice palette cancel. 6278 L NORTH KOREA (1981) Painting by Rembrandt*. Airmail letter to US franked with Michel Block 101A and nice palette cancel. 6279 L NORTH KOREA (1981) Self-portrait of Rubens*. Airmail letter to USA franked with Michel Block 104. 6458 L NORTH KOREA (1981) Mercedes 500 SEC*. Airmail letter to US franked with Michel No 2182. Philatelie Frankfurt Exhibition. 6521 L NORTH KOREA (1981) Dornier Do-X*. Zeppelin*. Man in armor*. 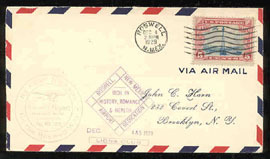 Airmail envelope to US franked with Michel Nos 2118-20. 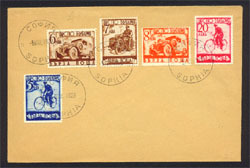 NAPOSTA Stamp Exhibition. 6522 L NORTH KOREA (1981) Dornier Do-X*. Zeppelin*. Man in armor*. Airmail envelope to US franked with Michel Nos 2118-20 imperforate. 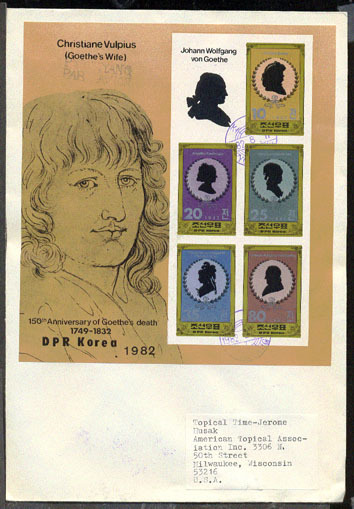 NAPOSTA Stamp Exhibition. 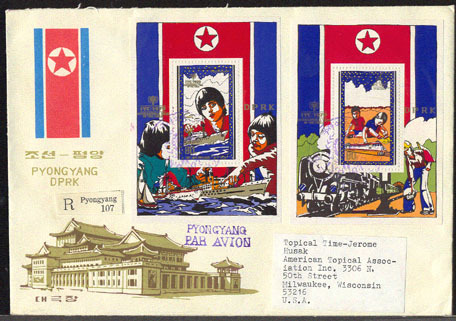 7213 L NORTH KOREA (1981) Fairy tales of North Korea*. 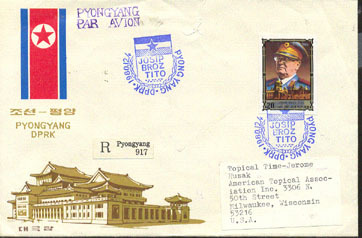 Airmail letter to US franked with Michel Block 91A. 7214 L NORTH KOREA (1981) Fairy tales of North Korea*. Airmail letter to US franked with Michel Block 91B imperforate. 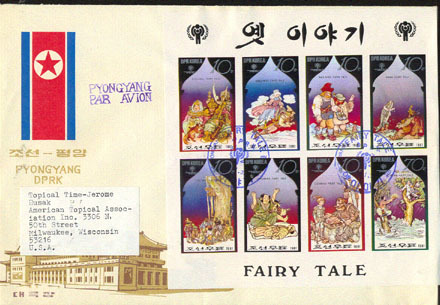 7215 L NORTH KOREA (1981) Fairy tales of various countries*. Airmail letter to US franked with Michel Nos 2081-7. 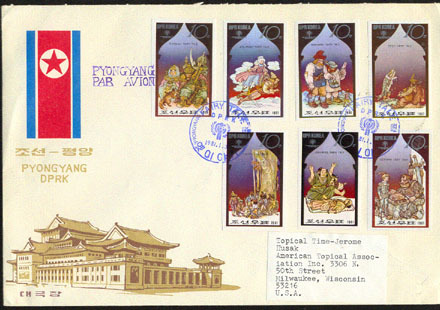 7216 L NORTH KOREA (1981) Fairy tales of various countries*. Airmail letter to US franked with Michel Nos 2081-7 imperforate. 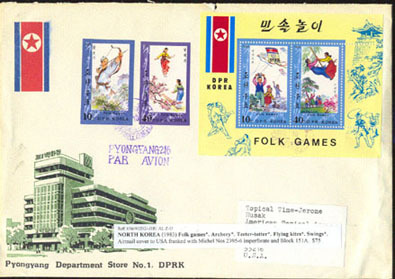 7217 L NORTH KOREA (1981) Fairy tales of various countries*. Airmail letter to US franked with Michel Nos 2081-8 sheetlet. 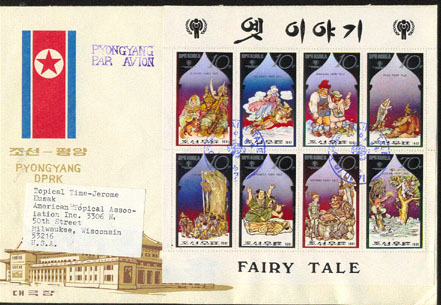 7218 L NORTH KOREA (1981) Fairy tales of various countries*. Airmail letter to US franked with Michel Nos 2081-8 imperforate sheetlet. 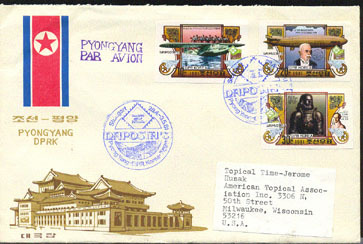 7307 L NORTH KOREA (1981) Iris*. Gladiolus*. Registered airmail letter to US franked with Michel Nos 2126-8 imperforate sheetlet. 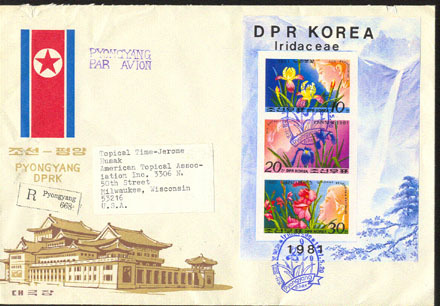 7308 L NORTH KOREA (1981) Iris*. Gladiolus*. Registered airmail letter to US franked with Michel Nos 2126-8. 7309 L NORTH KOREA (1981) Iris*. Gladiolus*. Registered airmail letter to US franked with Michel Nos 2126-8 imperforate. 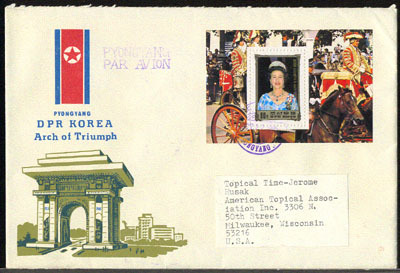 8094 L NORTH KOREA (1981) Joan of Arc*. Airmail letter to USA franked with Michel No 2142 & Block 100. 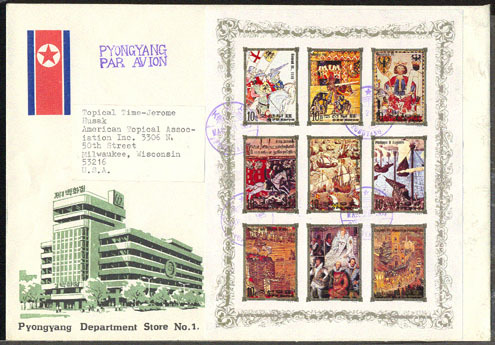 8095 L NORTH KOREA (1981) Joan of Arc*. Airmail letter to USA franked with Michel No 2142 & Block 100 imperforate. 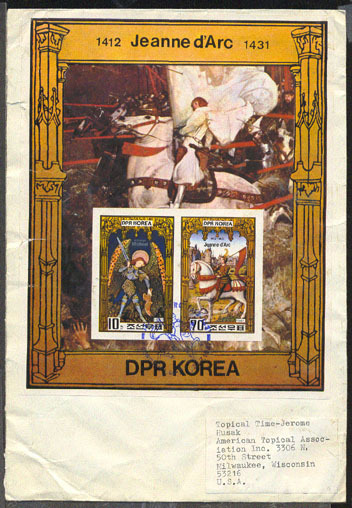 8096 L NORTH KOREA (1981) Joan of Arc*. 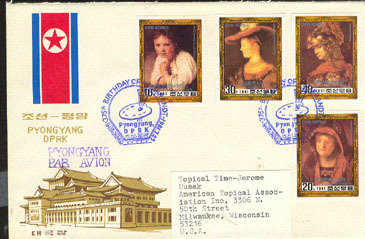 Airmail letter to USA franked with Michel Block 99 imperforate. 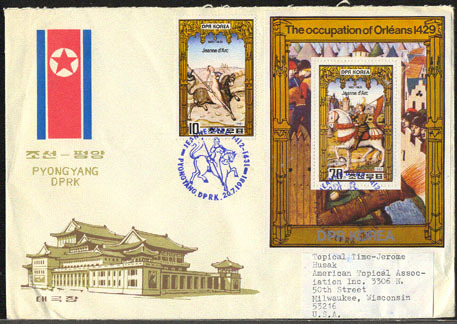 8232 L NORTH KOREA (1981) Gymnast*. Registered airmail letter to USA franked with Michel Block 98. Centenary of International Gymnastic Federation. 8233 L NORTH KOREA (1981) Gymnast*. 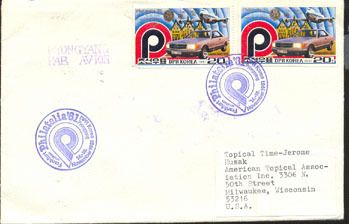 Airmail letter to USA franked with Michel Block 98. Centenary of International Gymnastic Federation. 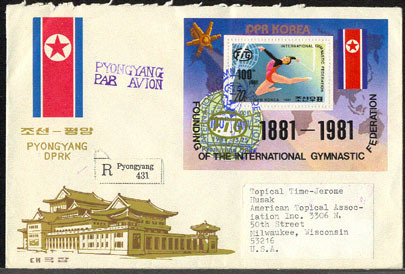 8234 L NORTH KOREA (1981) Gymnast*. Registered airmail letter to USA franked with Michel Nos 2130-4. Centenary of International Gymnastic Federation. 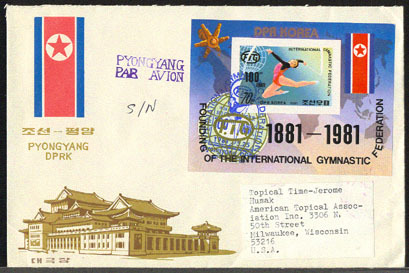 8235 L NORTH KOREA (1981) Gymnast*. Registered airmail letter to USA franked with Michel Nos 2130-4 imperforate. Centenary of International Gymnastic Federation. 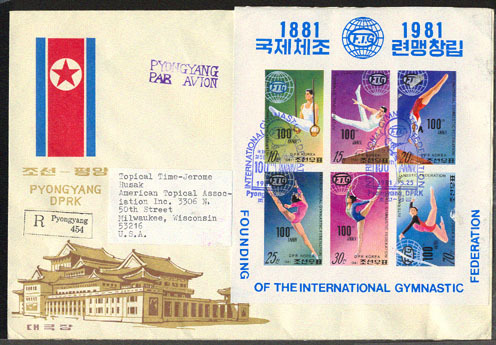 8236 L NORTH KOREA (1981) Gymnast*. Registered airmail letter to USA franked with Michel Nos 2130-4 S/S. Centenary of International Gymnastic Federation. 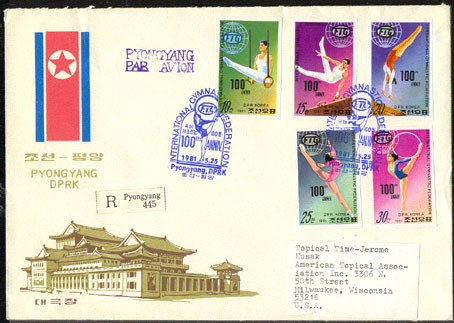 8237 L NORTH KOREA (1981) Gymnast*. Registered airmail letter to USA franked with Michel Nos 2130-4 imperforate S/S. Centenary of International Gymnastic Federation. 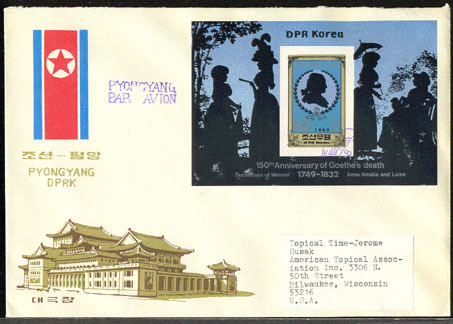 8429 L NORTH KOREA (1981) Kim Il Sung*. 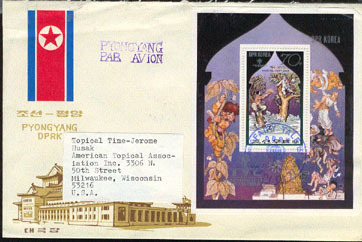 Airmail letter to USA franked with Michel Block 97. WIPA Exhibition. 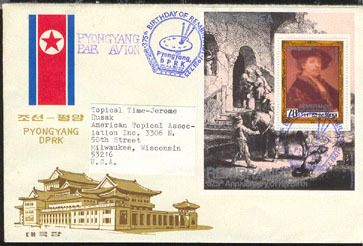 8430 L NORTH KOREA (1981) Kim Il Sung*. Airmail letter to USA franked with Michel Block 97 imperforate. WIPA Exhibition. 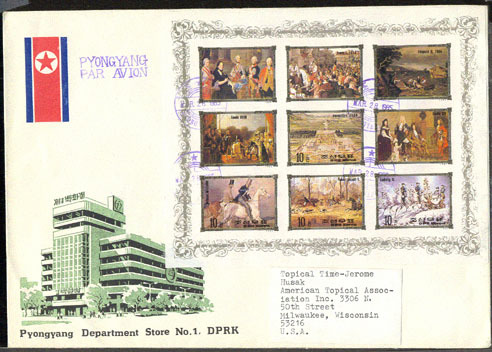 8431 L NORTH KOREA (1981) Various stamps*. Airmail letter to USA franked with Michel Nos 2123-4. WIPA Exhibition. 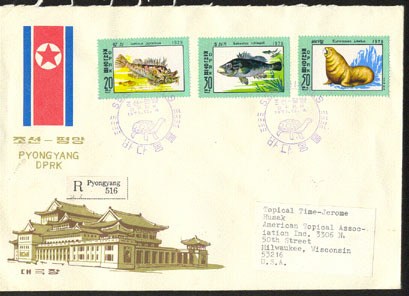 8432 L NORTH KOREA (1981) Various stamps*. Airmail letter to USA franked with Michel Nos 2123-4 imperforate. WIPA Exhibition. 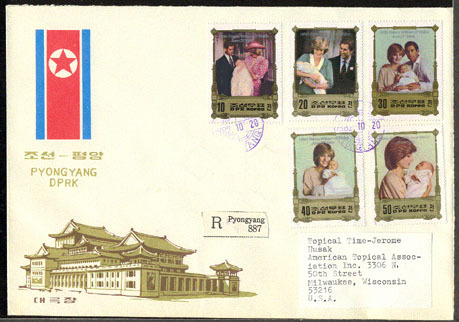 8809 L NORTH KOREA (1981) Princess Diana Wedding*. Airmail letter to USA franked with Michel Nos 2173-6 S/S. 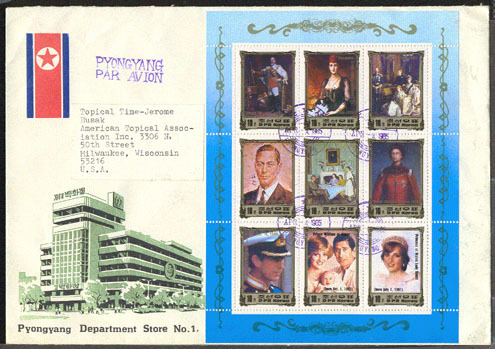 8810 L NORTH KOREA (1981) Princess Diana Wedding*. Airmail letter to USA franked with Michel Nos 2173-6 imperforate S/S. 8811 L NORTH KOREA (1981) Princess Diana Wedding*. Registered airmail letter to USA franked with Michel Block 105. 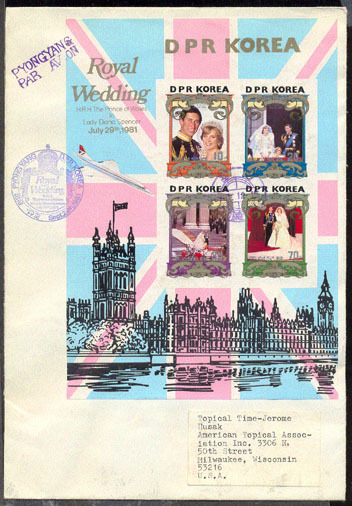 8812 L NORTH KOREA (1981) Princess Diana Wedding*. Registered airmail letter to USA franked with Michel Block 105 imperforate. 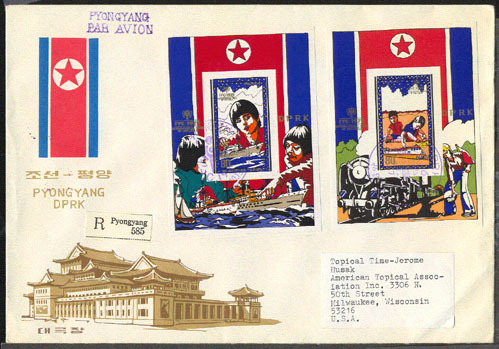 6281 L NORTH KOREA (1982) Paintings by Picasso*. Airmail registered cover to USA franked with Michel Nos 2219-22. 6282 L NORTH KOREA (1982) Paintings by Picasso*. Airmail registered cover to USA franked with Michel Nos 2219-22 imperforate. 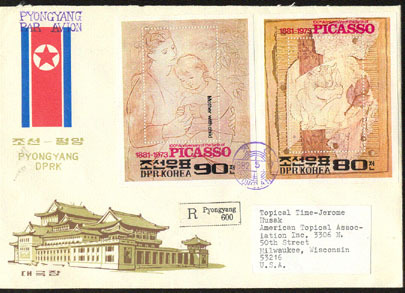 6283 L NORTH KOREA (1982) Paintings by Picasso*. Airmail registered cover to USA franked with Michel Blocks 110-1A. 6284 L NORTH KOREA (1982) Paintings by Picasso*. Airmail registered cover to USA franked with Michel Blocks 110-1B imperforate. 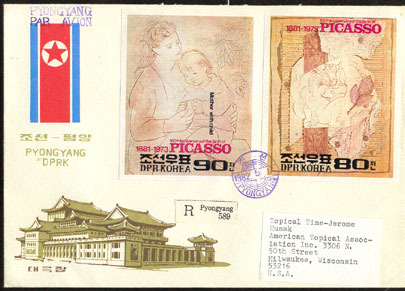 6285 L NORTH KOREA (1982) Paintings by Picasso*. Airmail registered cover to USA franked with Michel Nos 2223-8 imperforate sheetlet. 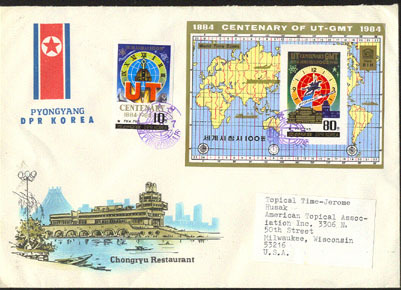 6410 L NORTH KOREA (1982) Goethe*. Airmail letter to USA franked with Michel Block 121. 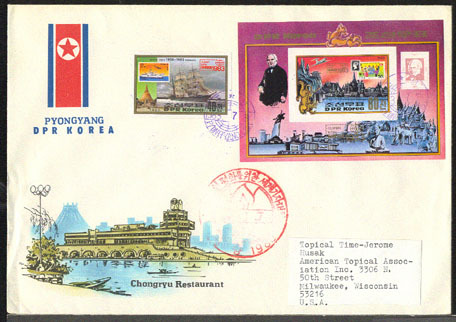 6411 L NORTH KOREA (1982) Goethe*. Airmail letter to USA franked with Michel Block 121 imperforate. 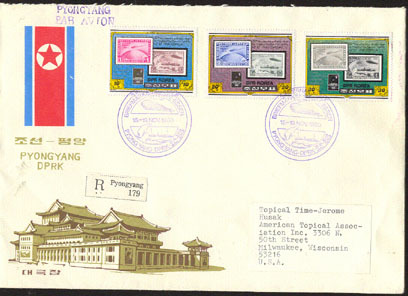 6412 L NORTH KOREA (1982) Goethe*. Airmail letter to USA franked with Michel Nos 2259-62. 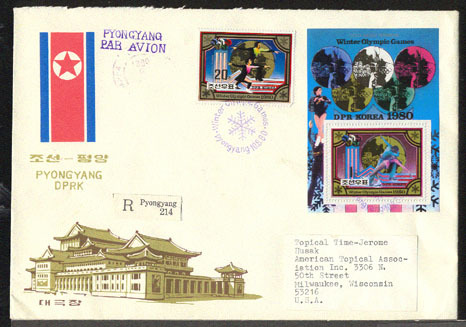 6413 L NORTH KOREA (1982) Goethe*. Airmail letter to USA franked with Michel Nos 2259-62 imperforate. 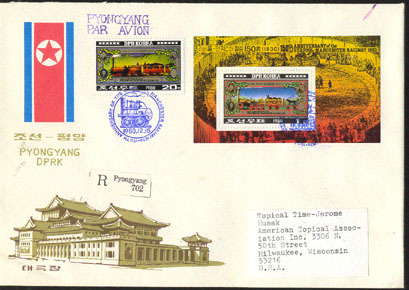 6414 L NORTH KOREA (1982) Goethe*. Airmail letter to USA franked with Michel Block 122 imperforate. 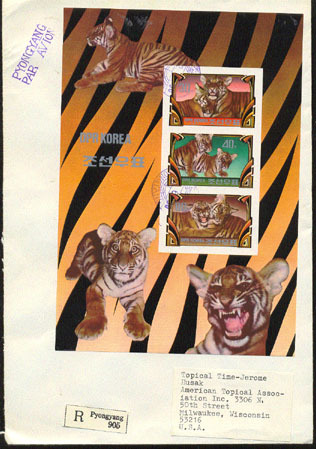 6851 L NORTH KOREA (1982) Tigers*. 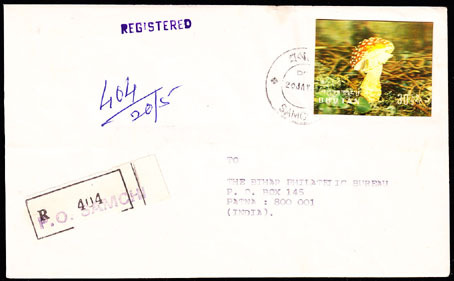 Registered airmail letter to US franked with Michel Block 117A. 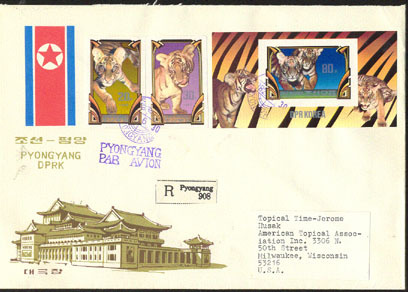 6852 L NORTH KOREA (1982) Tigers*. Registered airmail letter to US franked with Michel Block 117B imperforate. 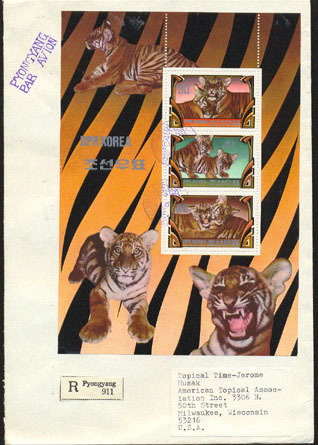 6853 L NORTH KOREA (1982) Tigers*. Registered airmail letter to US franked with Michel Nos 2242-3 and Block 116B imperforate. 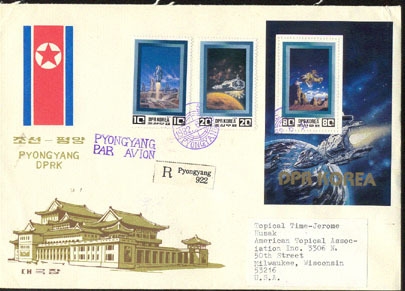 8197 L NORTH KOREA (1982) Futuristic spacecraft*. Airmail registered cover to USA franked with Michel Nos 2255-6 & Block 119A. 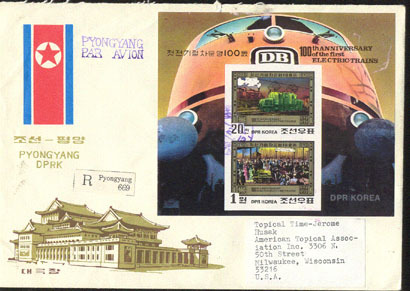 8198 L NORTH KOREA (1982) Futuristic spacecraft*. Airmail registered cover to USA franked with Michel Nos 2255-6 & Block 119B imperforate. 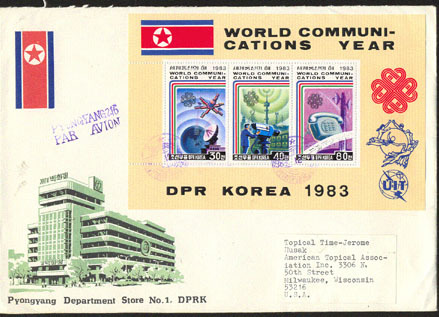 8199 L NORTH KOREA (1982) Spacecraft*. Registered airmail letter to US franked with Michel Nos 2255-7 perforate and imperforate sheetlets. 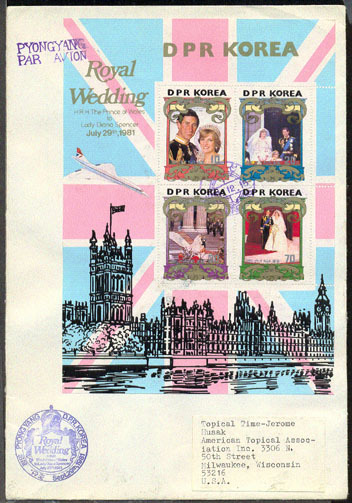 8813 L NORTH KOREA (1982) Princess Diana Wedding*. Registered airmail letter to USA franked with Michel Block 103. 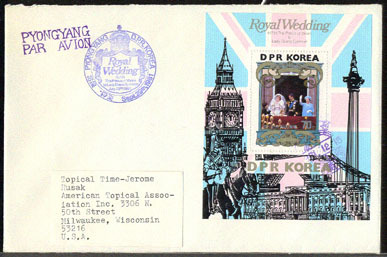 8814 L NORTH KOREA (1982) Princess Diana Wedding*. Registered airmail letter to USA franked with Michel Block 103 imperforate. 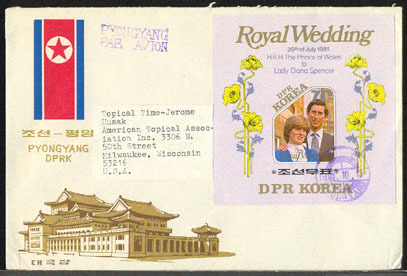 8815 L NORTH KOREA (1982) Princess Diana Wedding*. Registered airmail letter to USA franked with Michel Nos 2161-4. 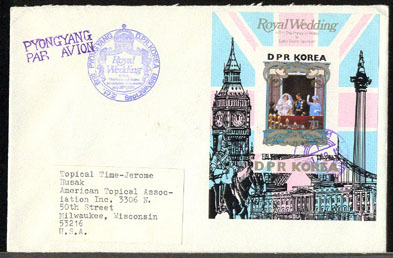 8816 L NORTH KOREA (1982) Princess Diana Wedding*. Registered airmail letter to USA franked with Michel Nos 2161-4 imperforate. 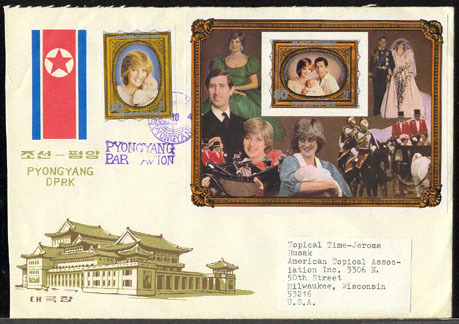 8817 L NORTH KOREA (1982) Princess Diana & Family*. Registered airmail letter to USA franked with Michel Nos 2276-80. 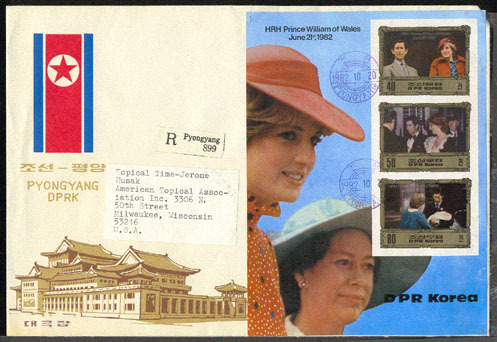 8818 L NORTH KOREA (1982) Princess Diana & Family*. Registered airmail letter to USA franked with Michel Nos 2276-80 imperforate. 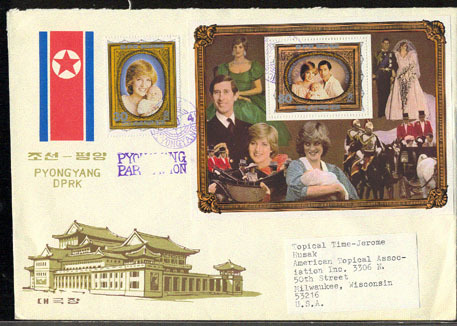 8819 L NORTH KOREA (1982) Princess Diana & Family*. Registered airmail letter to USA franked with Michel No 2274 & Block 125. 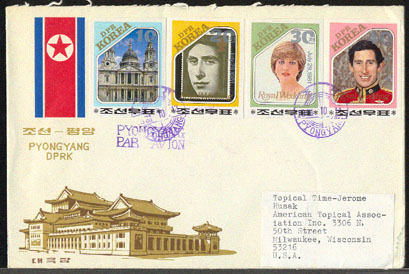 8820 L NORTH KOREA (1982) Princess Diana & Family*. 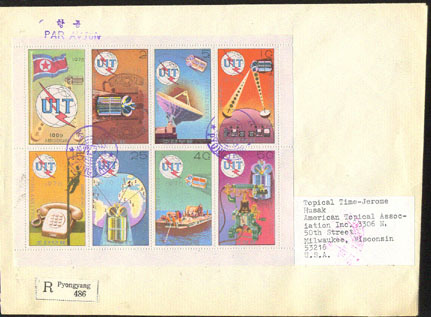 Registered airmail letter to USA franked with Michel No 2274 & Block 125 imperforate. 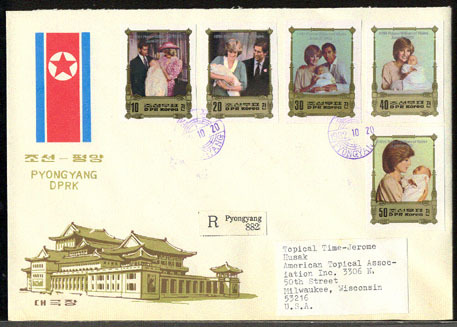 8821 L NORTH KOREA (1982) Princess Diana & Family*. Registered airmail letter to USA franked with Michel Block 129 imperforate. 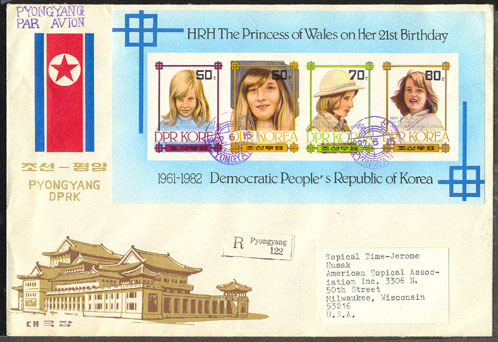 8822 L NORTH KOREA (1982) Princess Diana as a Child*. Registered airmail letter to USA franked with Michel Block 115. 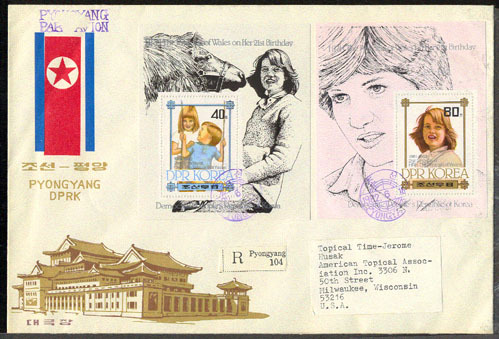 8823 L NORTH KOREA (1982) Princess Diana as a Child*. Registered airmail letter to USA franked with Michel Block 115 imperforate. 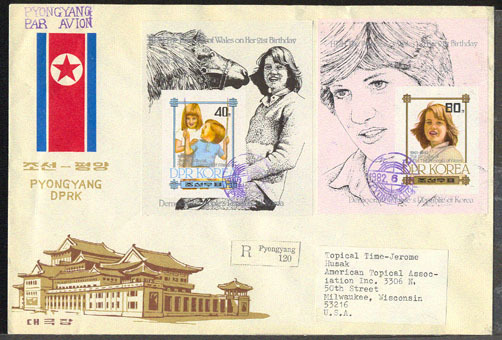 8824 L NORTH KOREA (1982) Princess Diana as a Child*. Registered airmail letter to USA franked with Michel Blocks 113 & 114. 8825 L NORTH KOREA (1982) Princess Diana as a Child*. 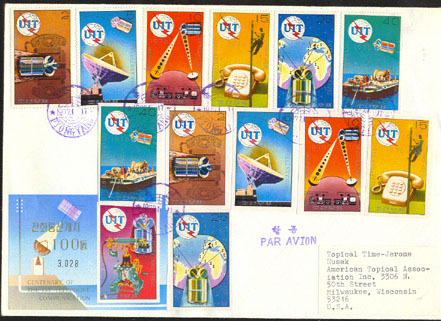 Registered airmail letter to USA franked with Michel Blocks 113 & 114 imperforate. 6288 L NORTH KOREA (1983) Painting by Lochner*. Airmail letter to USA franked with Michel Block 139. 6289 L NORTH KOREA (1983) Painting by Lochner*. Airmail letter to USA franked with Michel Block 139 imperforate. 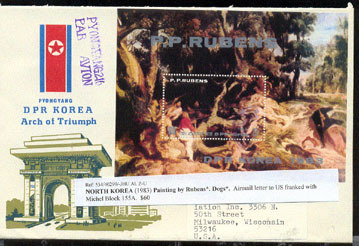 6291 L NORTH KOREA (1983) Paintings by Rubens*. Airmail letter to USA franked with Michel No 2406 & Block 155. 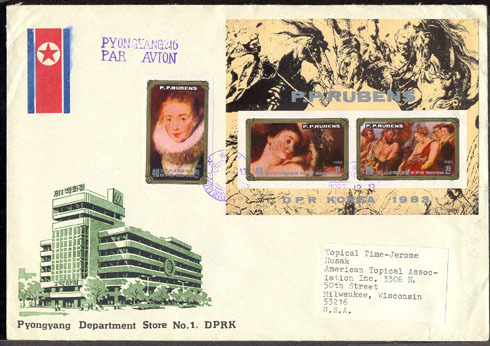 6292 L NORTH KOREA (1983) Paintings by Rubens*. Airmail letter to USA franked with Michel No 2406 & Block 155 imperforate. 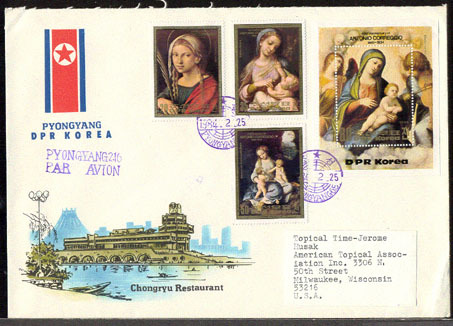 6295 L NORTH KOREA (1983) Paintings by Raphael*. Airmail letter to USA franked with Michel Block 141 imperforate. 6296 L NORTH KOREA (1983) Paintings by Rembrandt*. Airmail letter to USA franked with Michel Block 138. 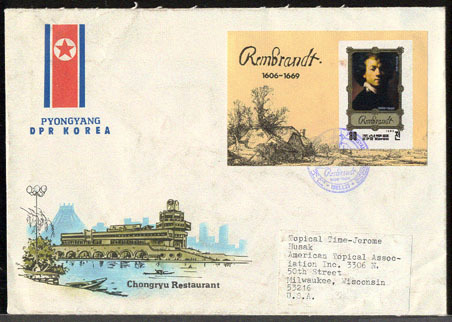 6297 L NORTH KOREA (1983) Paintings by Rembrandt*. Airmail letter to USA franked with Michel Block 138 imperforate. 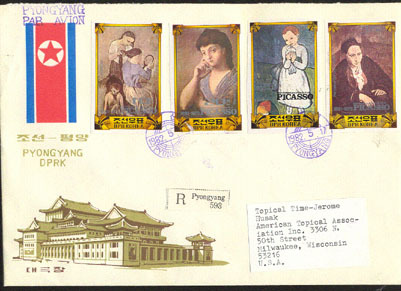 6298 L NORTH KOREA (1983) Paintings by Corregio*. Airmail letter to USA franked with Michel Nos 2423-5 & Block 164. 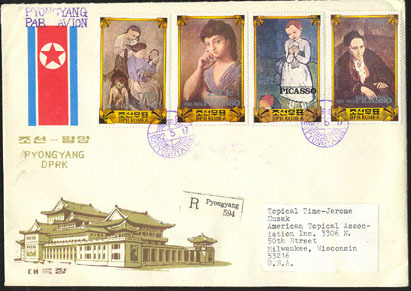 6299 L NORTH KOREA (1983) Paintings by Corregio*. Airmail letter to USA franked with Michel Nos 2423-5 & Block 164 imperforate. 6300 L NORTH KOREA (1983) Painting by Rubens*. Dogs*. Airmail letter to US franked with Michel Block 155A. 6301 L NORTH KOREA (1983) Painting by Rubens*. Dogs*. Airmail letter to US franked with Michel Block 155B imperforate. 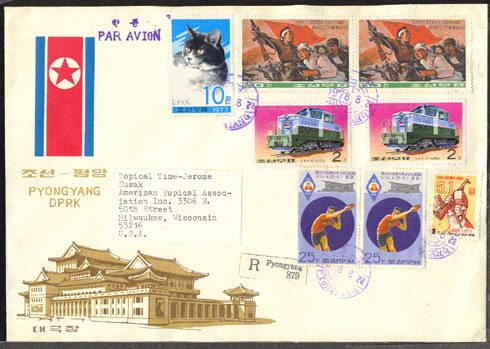 6854 L NORTH KOREA (1983) Cats*. Airmail letter to US franked with Michel Nos 2431-5. 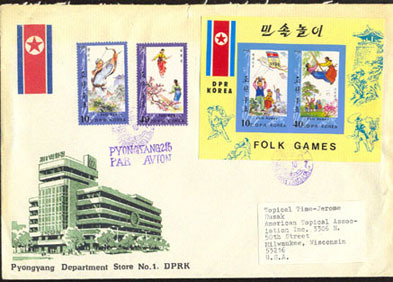 7392 L NORTH KOREA (1983) Folk games*. Archery*. Teeter-totter*. Flying kites*. Swings*. Airmail cover to USA franked with Michel Nos 2395-6 imperforate and Block 151A. 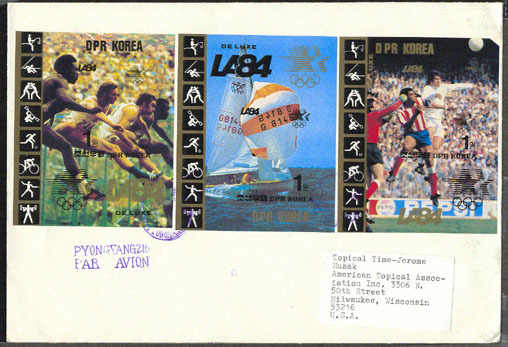 7393 L NORTH KOREA (1983) Folk games*. Archery*. Teeter-totter*. Flying kites*. Swings*. Airmail cover to USA franked with Michel Nos 2395-6 and Block 151B imperforate. 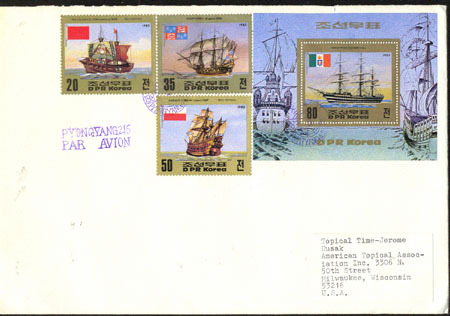 8171 L NORTH KOREA (1983) Sailing ships*. Columbus*. 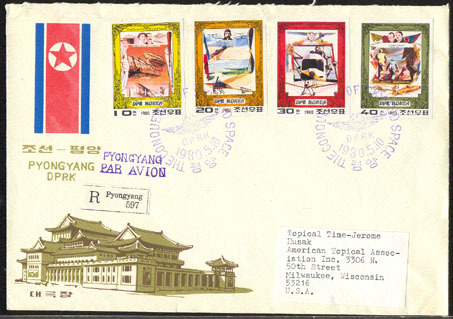 Airmail cover to USA franked with Michel Nos 2363-5 and Block 144A. 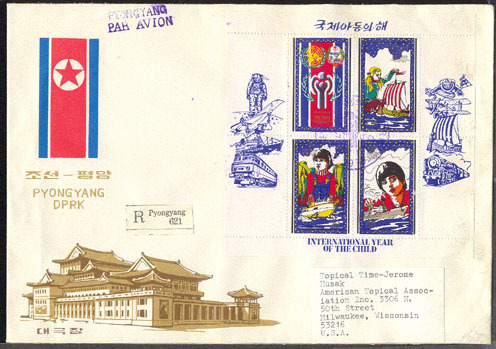 8172 L NORTH KOREA (1983) Sailing ships*. Columbus*. Airmail cover to USA franked with Michel Nos 2363-5 and Block 144B imperforate. 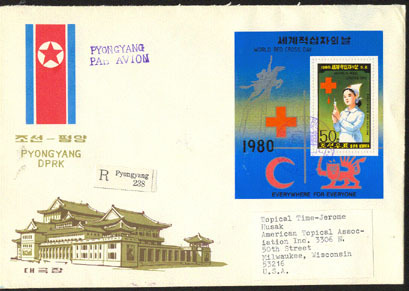 8241 L NORTH KOREA (1983) Judo*. Airmail letter to USA franked with Michel Block 142. Los Angeles Olympics. 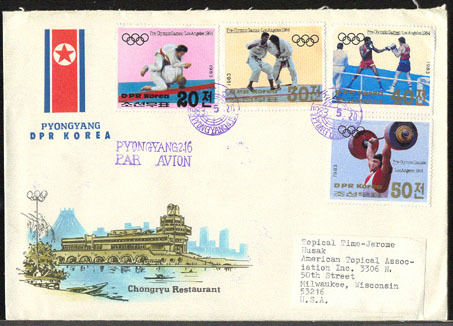 8242 L NORTH KOREA (1983) Judo*. Airmail letter to USA franked with Michel Block 142 imperforate. Los Angeles Olympics. 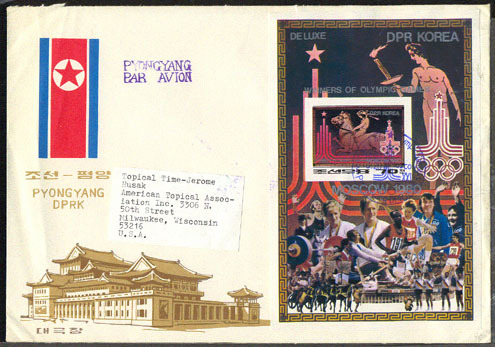 8277 L NORTH KOREA (1983) Judo*. Boxing*. Weightlifting*. Airmail letter to USA franked with Michel Nos 2350-3. Los Angeles Olympics. 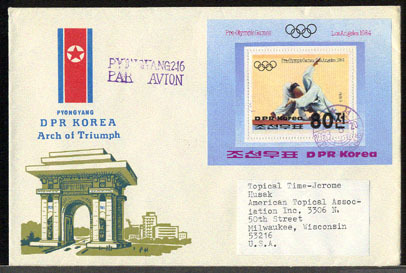 8278 L NORTH KOREA (1983) Judo*. Boxing*. Weightlifting*. Airmail letter to USA franked with Michel Nos 2350-3 imperforate. Los Angeles Olympics. 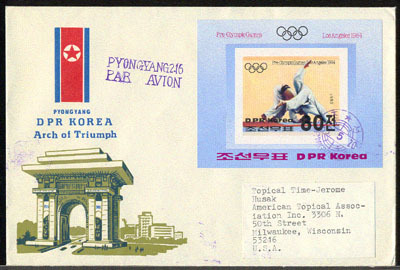 8279 L NORTH KOREA (1983) Hurdling*. Sailing*. Soccer*. Airmail letter to USA franked with Michel Blocks 2414-6. Los Angeles Olympics. 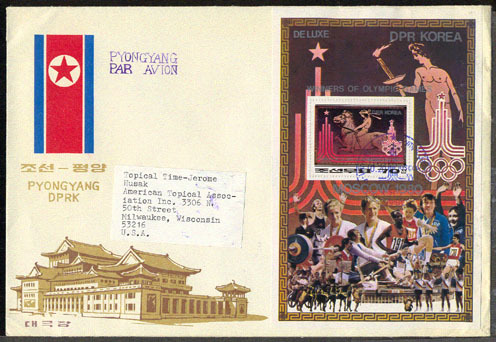 8280 L NORTH KOREA (1983) Hurdling*. Sailing*. Soccer*. Airmail letter to USA franked with Michel Blocks 2414-6 imperforate. Los Angeles Olympics. 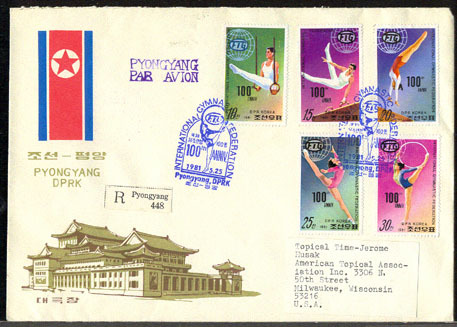 8281 L NORTH KOREA (1983) Gymnastics*. Basketball*. Boxing*. Airmail letter to USA franked with Michel Blocks 2417-9 imperforate. Los Angeles Olympics. 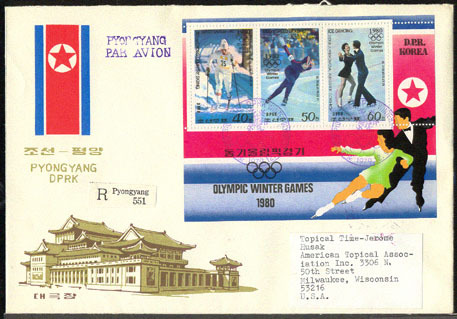 8309 L NORTH KOREA (1983) Skating*. Hockey*. 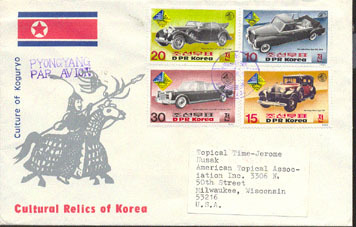 Airmail cover to USA franked with Michel Block 150 sheetlet. 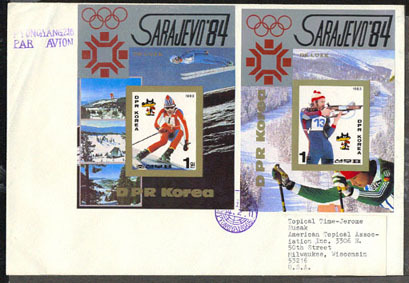 Sarajevo Olympics. 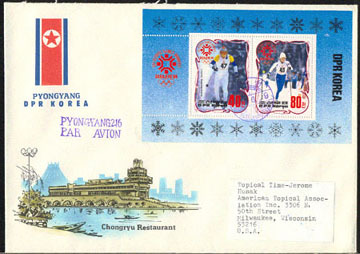 8310 L NORTH KOREA (1983) Skating*. Hockey*. 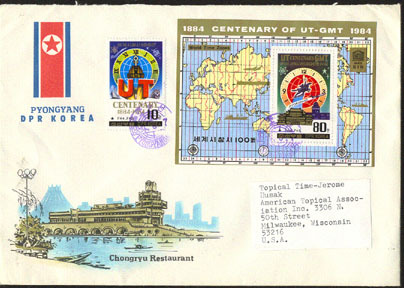 Airmail cover to USA franked with Michel Block 150 sheetlet imperforate. 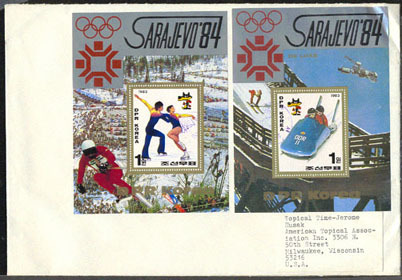 Sarajevo Olympics. 8311 L NORTH KOREA (1983) Skating*. Bobsled*. 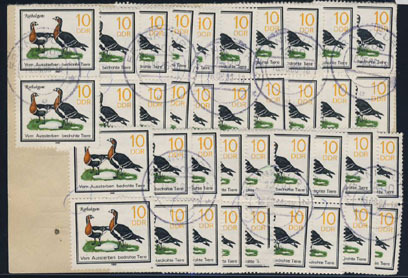 Airmail cover to USA franked with Michel Blocks 170 & 171 sheetlet. 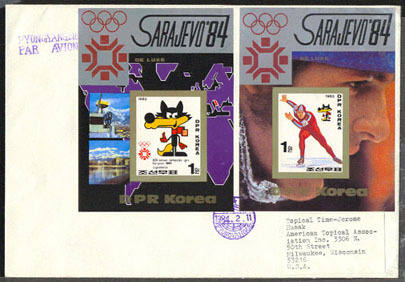 Sarajevo Olympics. 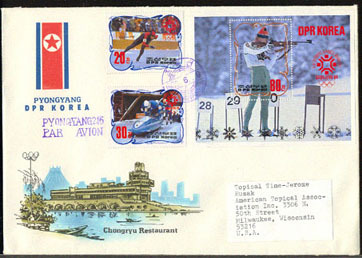 8312 L NORTH KOREA (1983) Skating*. Bobsled*. Airmail cover to USA franked with Michel Blocks 170 & 171 sheetlet imperforate. Sarajevo Olympics. 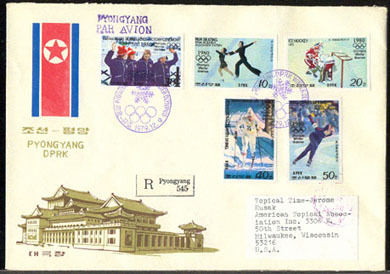 8313 L NORTH KOREA (1983) Speed skating*. Wolf*. Airmail cover to USA franked with Michel Blocks 166 & 169 sheetlet. 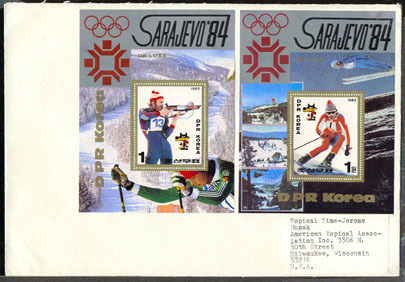 Sarajevo Olympics. 8314 L NORTH KOREA (1983) Speed skating*. Wolf*. Airmail cover to USA franked with Michel Blocks 166 & 169 sheetlet imperforate. Sarajevo Olympics. 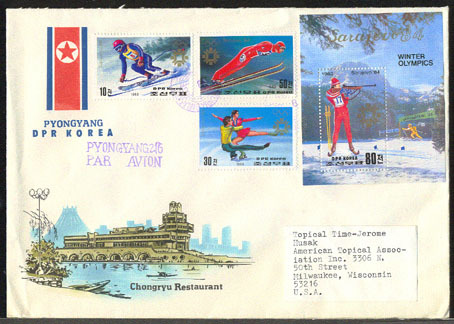 8315 L NORTH KOREA (1983) Downhill skiing*. Biathlon*. 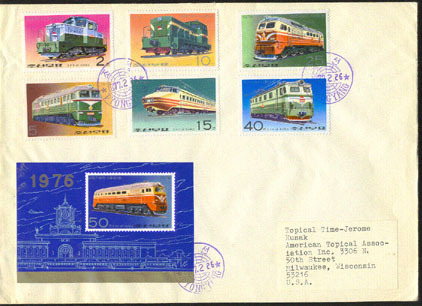 Airmail cover to USA franked with Michel Blocks 167 & 168 sheetlet. Sarajevo Olympics. 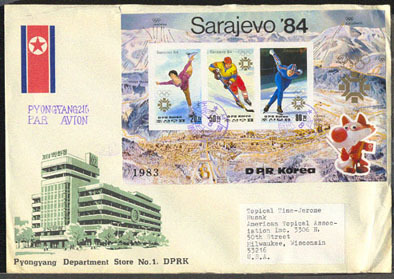 8316 L NORTH KOREA (1983) Downhill skiing*. Biathlon*. 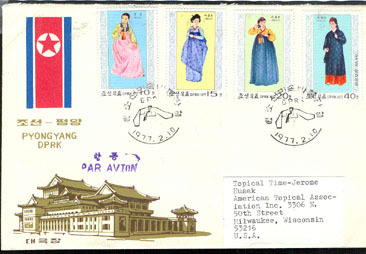 Airmail cover to USA franked with Michel Blocks 167 & 168 sheetlet imperforate. Sarajevo Olympics. 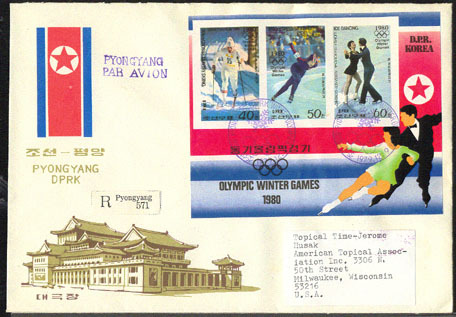 8317 L NORTH KOREA (1983) Skating*. Ski Jump*. Hockey*. 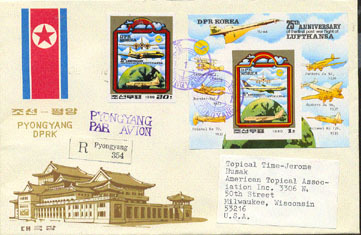 Airmail cover to USA franked with Michel Nos 2387-9 and Block 149 sheetlet. Sarajevo Olympics. 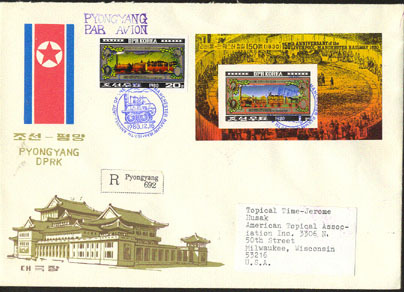 8318 L NORTH KOREA (1983) Skating*. Ski Jump*. Hockey*. 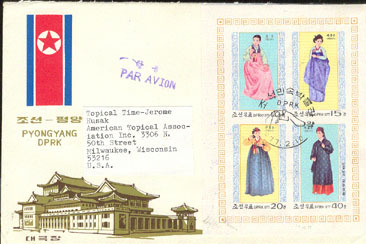 Airmail cover to USA franked with Michel Nos 2387-9 and Block 149 sheetlet imperforate. Sarajevo Olympics. 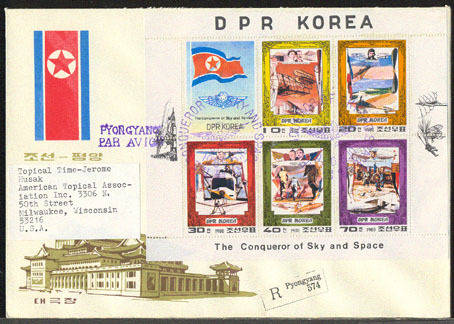 8434 L NORTH KOREA (1983) Various stamps*. 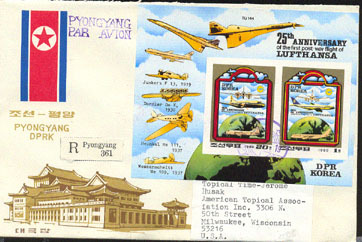 Airmail letter to USA franked with Michel No 2385 & Block 148. Bangkok Exhibition. 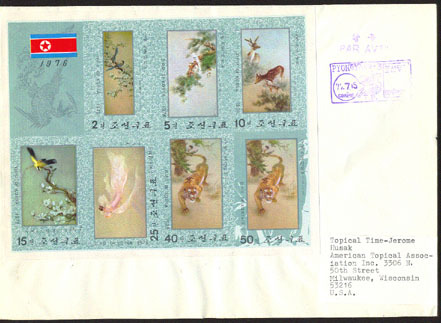 8435 L NORTH KOREA (1983) Various stamps*. Airmail letter to USA franked with Michel No 2385 & Block 148 imperforate. Bangkok Exhibition. 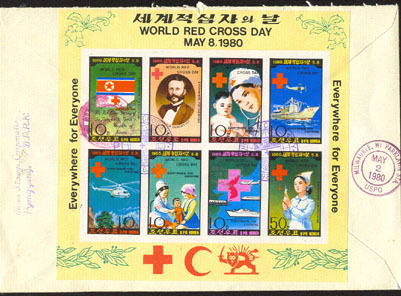 8486 L NORTH KOREA (1983) Paper punch tape*. Symbols of communication*. 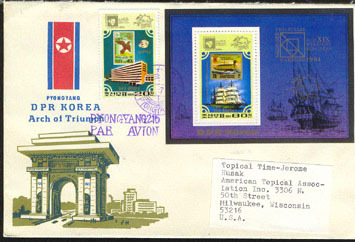 Airmail letter to US franked with Michel Block 153A. World Telecommunications Day. 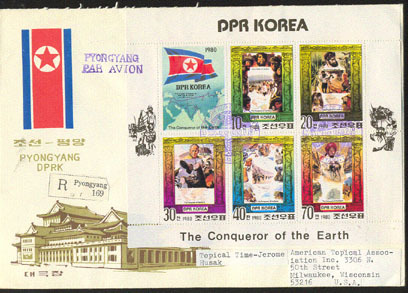 8487 L NORTH KOREA (1983) Paper punch tape*. Symbols of communication*. Airmail letter to US franked with Michel Block 153B imperforate. World Telecommunications Day. 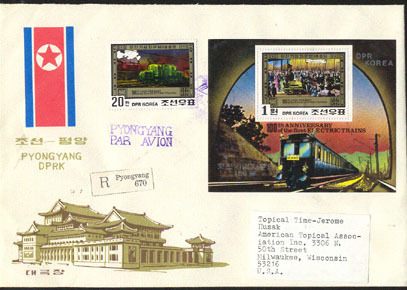 8604 L NORTH KOREA (1983) Locomotives*. 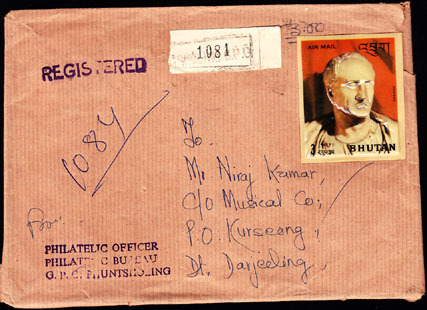 Airmail letter to US franked with Michel Block 147A. 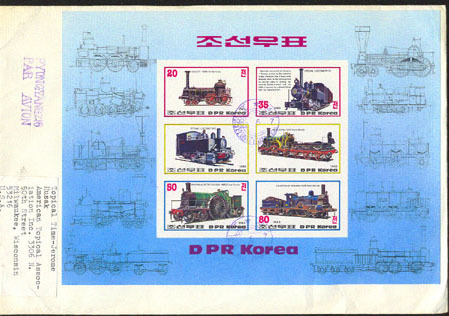 8605 L NORTH KOREA (1983) Locomotives*. Airmail letter to US franked with Michel Block 147B imperforate. 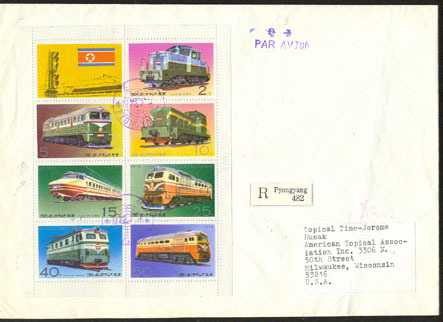 8606 L NORTH KOREA (1983) Locomotives*. Airmail letter to US franked with Michel Nos 2371-3 and Block 146A. 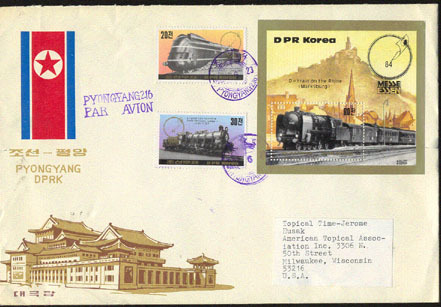 8607 L NORTH KOREA (1983) Locomotives*. Airmail letter to US franked with Michel Nos 2371-3 and Block 146B imperforate. 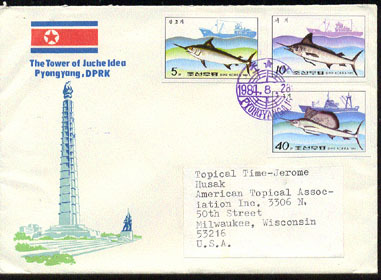 4103 L NORTH KOREA (1984) Swordfish*. Marlin*. Sailfish*. Airmail letter to USA franked with Michel Nos 2486-8 imperforate. 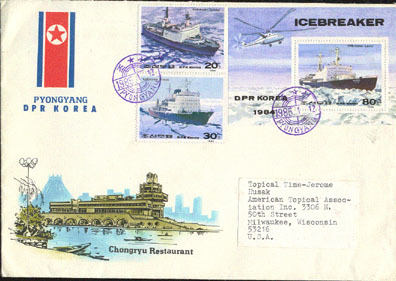 6124 L NORTH KOREA (1984) Icebreakers*. Helicopter*. Airmail registered cover to USA franked with Michel Nos 2526-7 & Block 191A. 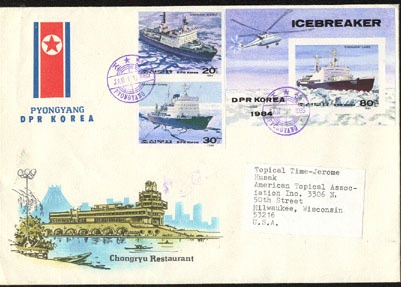 6125 L NORTH KOREA (1984) Icebreakers*. Helicopter*. Airmail registered cover to USA franked with Michel Nos 2526-7 & Block 191B imperforate. 6303 L NORTH KOREA (1984) Paintings by Raphael*. Airmail letter to USA franked with Michel Nos 2452-4 & Block 173. 6304 L NORTH KOREA (1984) Paintings by Raphael*. Airmail letter to USA franked with Michel Nos 2452-4 & Block 173 imperforate. 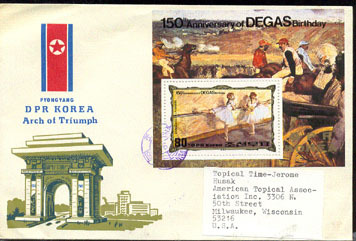 6305 L NORTH KOREA (1984) Paintings by Rembrandt*. Airmail letter to USA franked with Michel Nos 2323-6. 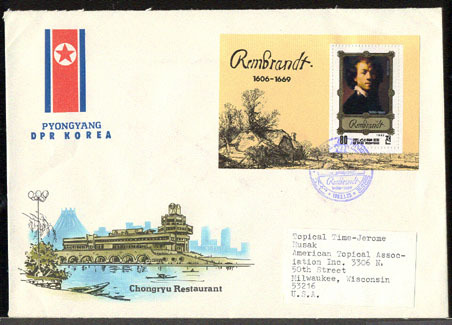 6306 L NORTH KOREA (1984) Paintings by Rembrandt*. Airmail letter to USA franked with Michel Nos 2323-6 imperforate. 6307 L NORTH KOREA (1984) Self-portrait of Rembrandt*. Airmail letter to USA franked with Michel Block 137. 6308 L NORTH KOREA (1984) Self-portrait of Rembrandt*. Airmail letter to USA franked with Michel Block 137 imperforate. 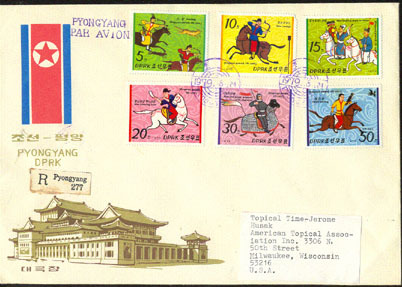 6309 L NORTH KOREA (1984) Horses*. Ballet scene*. Airmail letter to US franked with Michel Nos 2468-70. Degas 150th anniversary. 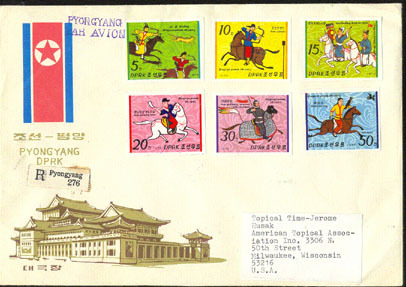 6310 L NORTH KOREA (1984) Horses*. Ballet scene*. Airmail letter to US franked with Michel Nos 2468-70 imperforate. Degas 150th anniversary. 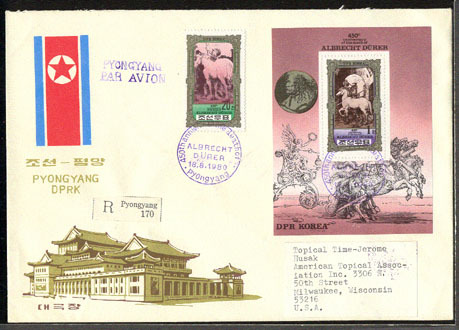 6311 L NORTH KOREA (1984) Horses*. Ballet scene*. Airmail letter to US franked with Michel Block 178A. Degas 150th anniversary. 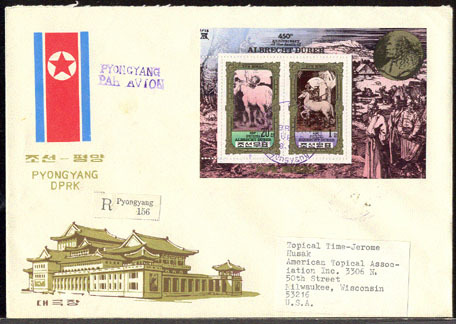 6312 L NORTH KOREA (1984) Horses*. Ballet scene*. Airmail letter to US franked with Michel Block 178B imperforate. Degas 150th anniversary. 7459 L NORTH KOREA (1984) Horse riding school*. 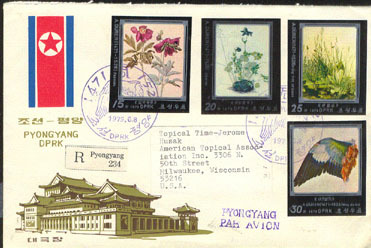 Airmail cover to USA franked with Michel Block 172A. 7460 L NORTH KOREA (1984) Horse riding school*. 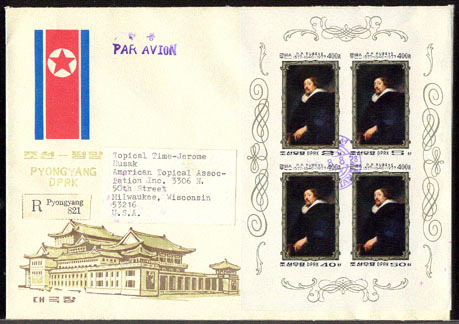 Airmail cover to USA franked with Michel Block 172B imperforate. 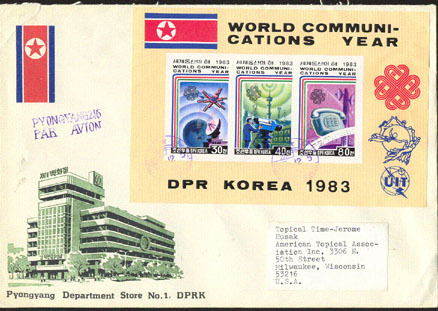 7833 L NORTH KOREA (1984) Nobel*. 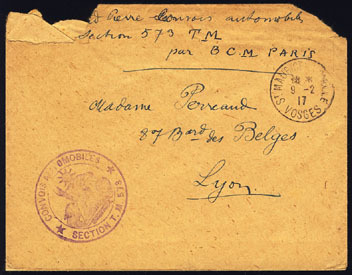 Airmail envelope to US franked with Michel Nos 2476-7. 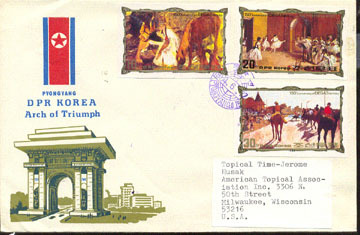 7834 L NORTH KOREA (1984) Nobel*. Airmail envelope to US franked with Michel Nos 2476-7 imperforate. 7835 L NORTH KOREA (1984) Nobel*. 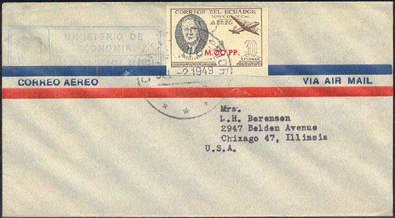 Airmail envelope to US franked with Michel Block 180B imperforate. 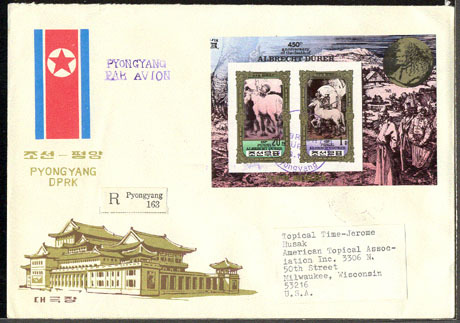 8201 L NORTH KOREA (1984) K.E. Tsiolkovsky*. Space themes*. Airmail letter to US franked with Michel Nos 2503-4 and Block 185. Tsiolkovsky was a Soviet pioneer of astronautics. 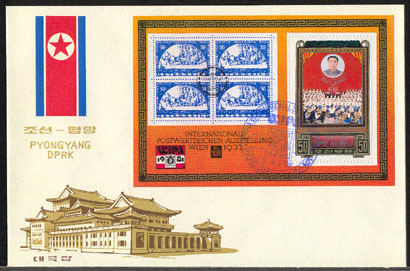 8319 L NORTH KOREA (1984) Rifle*. Speed skater*. Bobsled*. Airmail cover to USA franked with Michel Nos 2457-8, Block 174A. Sarajevo Olympics. 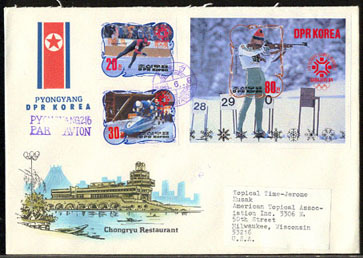 8320 L NORTH KOREA (1984) Rifle*. Speed skater*. Bobsled*. Airmail cover to USA franked with Michel Nos 2457-8, Block 174A imperforate. Sarajevo Olympics. 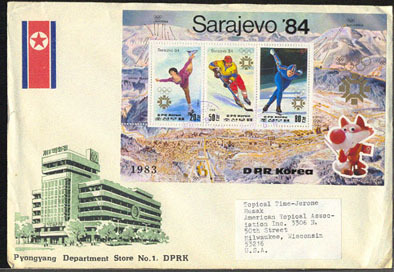 8336 L NORTH KOREA (1984) Various skiers*. 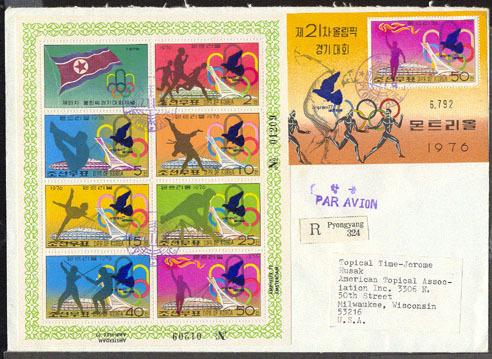 Airmail cover to USA franked with Michel Block 176 sheetlet imperforate. Sarajevo Olympics. 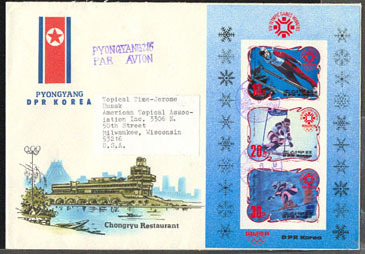 8337 L NORTH KOREA (1984) Various skiers*. 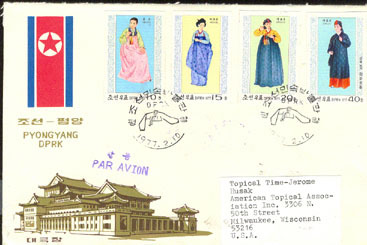 Airmail cover to USA franked with Michel Block 175 sheetlet. Sarajevo Olympics. 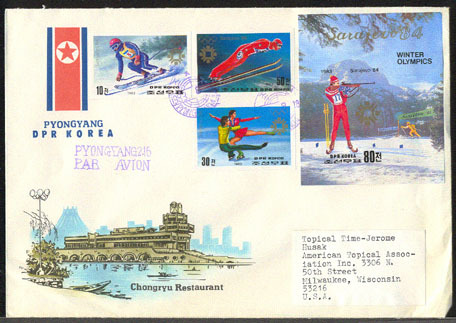 8338 L NORTH KOREA (1984) Various skiers*. 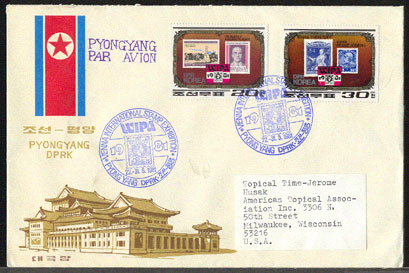 Airmail cover to USA franked with Michel Block 175 sheetlet imperforate. 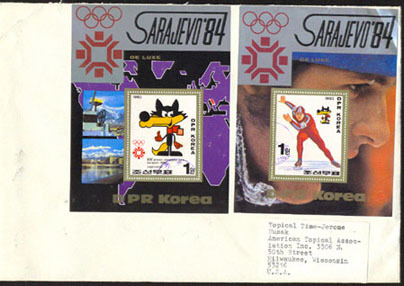 Sarajevo Olympics. 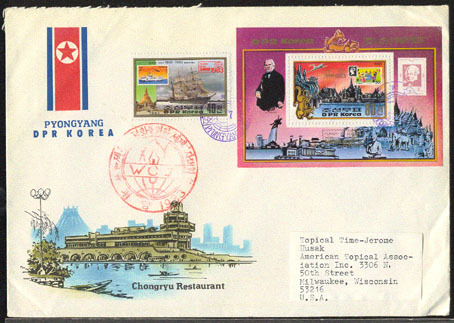 8436 L NORTH KOREA (1984) Sailing ship*. Early wooden armored ship*. Airmail letter to US franked with Michel No 2473 and Block 179A. 8547 L NORTH KOREA (1984) Clock*. Map of world divided into time zones*. Airmail letter to US franked with Michel No 2495 and Block 183A. Centenary of Universal Time. 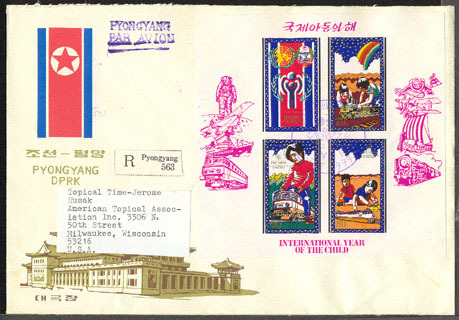 8548 L NORTH KOREA (1984) Clock*. Map of world divided into time zones*. Airmail letter to US franked with Michel No 2495 and Block 183B imperforate. Centenary of Universal Time. 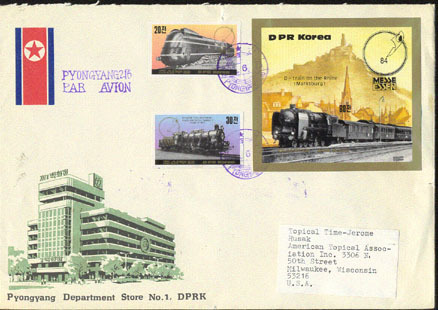 8608 L NORTH KOREA (1984) Krupp trains*. Airmail letter to US franked with Michel Nos 2465-6 and Block 177A. 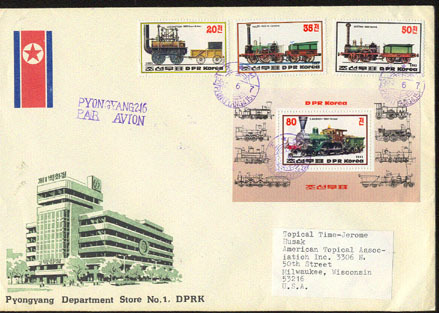 8609 L NORTH KOREA (1984) Krupp Trains*. Airmail letter to US franked with Michel Nos 2465-6 and Block 177B imperforate. 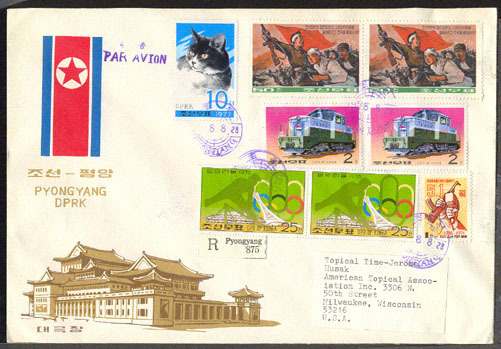 8610 L NORTH KOREA (1984) Trains*. Map of Route*. Airmail letter to US franked with Michel Nos 2491-3 and Block 182A. 100th anniversary of the Orient Express. 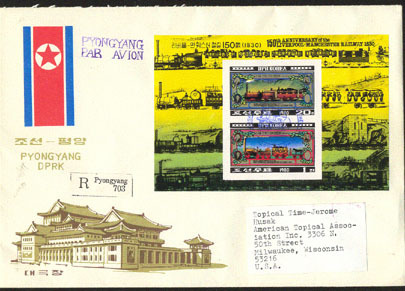 8611 L NORTH KOREA (1984) Trains*. Map of Route*. Airmail letter to US franked with Michel Nos 2491-3 and Block 182B imperforate. 100th anniversary of the Orient Express. 8826 L NORTH KOREA (1984) Various pre-17th century Kings & Queens of Europe*. 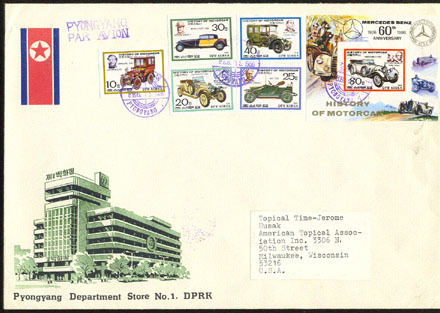 Airmail letter to USA franked with block of 9 different stamps in the form of a souvenir sheet from Michel Nos 2531//2611. 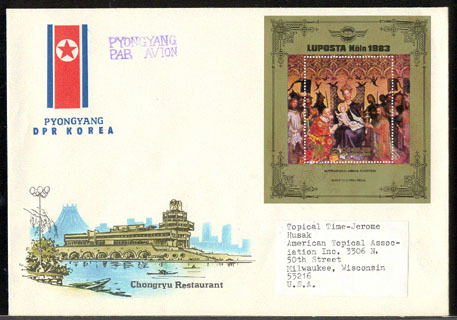 8827 L NORTH KOREA (1984) Various pre-17th century Kings & Queens of Europe*. Airmail letter to USA franked with block of 9 different stamps in the form of an imoperforate souvenir sheet from Michel Nos 2531//2611. 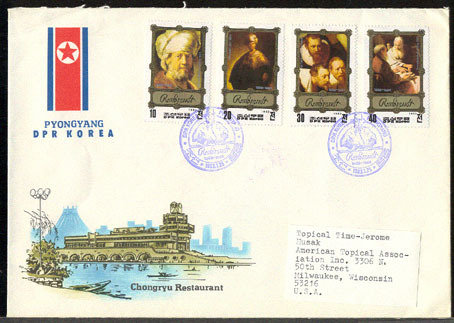 8828 L NORTH KOREA (1984) Various 17th & 18th century Kings & Queens of Europe*. Airmail letter to USA franked with block of 9 different stamps in the form of a souvenir sheet from Michel Nos 2531//2611. 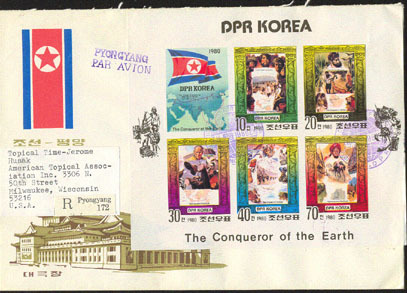 8829 L NORTH KOREA (1984) Various 17th & 18th century Kings & Queens of Europe*. Airmail letter to USA franked with block of 9 different stamps in the form of an imperforate souvenir sheet from Michel Nos 2531//2611. 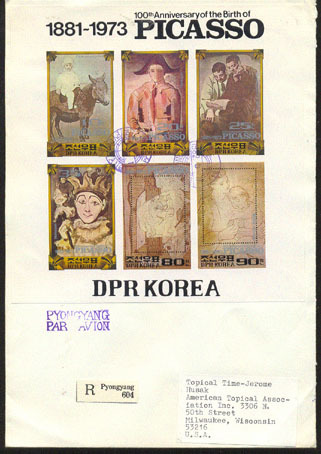 8830 L NORTH KOREA (1984) Various 19th century Kings & Queens of Europe*. 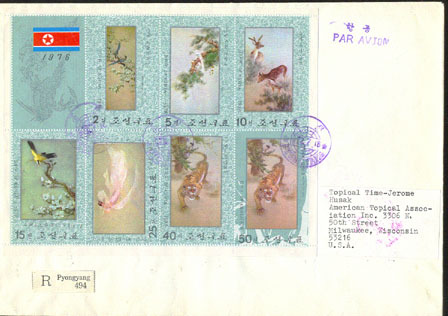 Airmail letter to USA franked with block of 9 different stamps in the form of a souvenir sheet from Michel Nos 2531//2611. 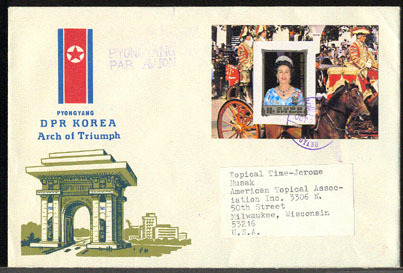 8831 L NORTH KOREA (1984) Various 19th century Kings & Queens of Europe*. Airmail letter to USA franked with block of 9 different stamps in the form of an imperforate souvenir sheet from Michel Nos 2531//2611. 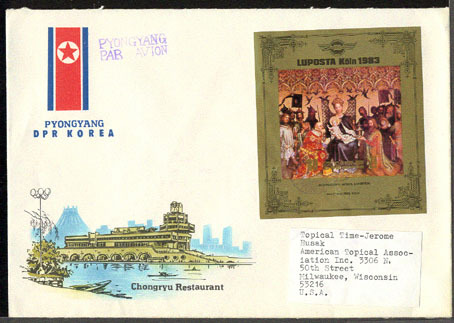 8832 L NORTH KOREA (1984) Various 18th century Kings & Queens of Europe*. 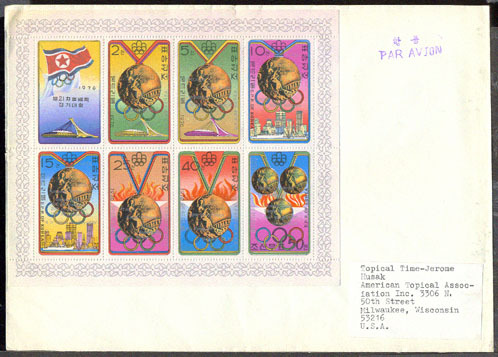 Airmail letter to USA franked with block of 9 different stamps in the form of a souvenir sheet from Michel Nos 2531//2611. 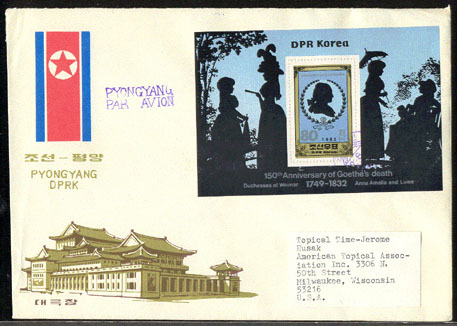 8833 L NORTH KOREA (1984) Various 18th century Kings & Queens of Europe*. Airmail letter to USA franked with block of 9 different stamps in the form of an imperforate souvenir sheet from Michel Nos 2531//2611. 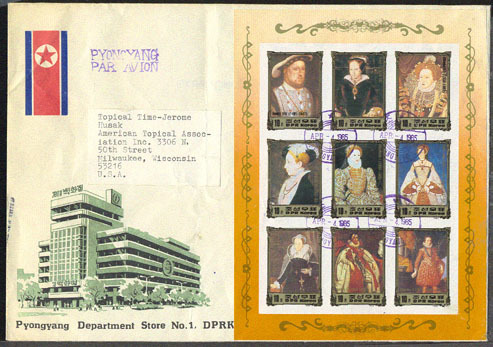 8834 L NORTH KOREA (1984) Various 14th & 15th century Kings & Queens of Europe*. Airmail letter to USA franked with block of 9 different stamps in the form of an imperforate souvenir sheet from Michel Nos 2531//2611. 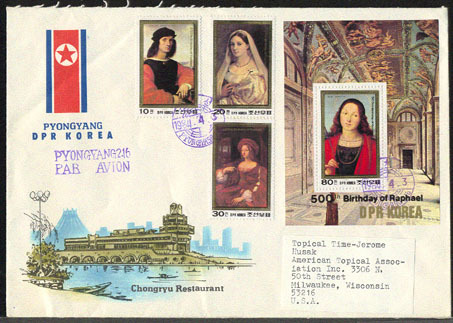 8835 L NORTH KOREA (1984) Various 15th-17th century Kings & Queens of Europe*. Airmail letter to USA franked with block of 9 different stamps in the form of a souvenir sheet from Michel Nos 2531//2611. 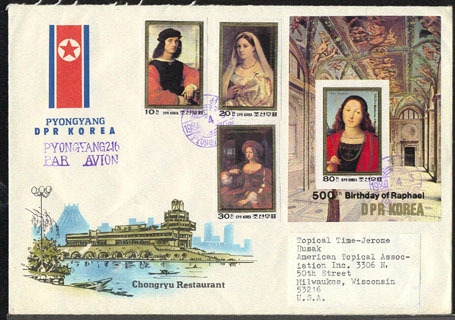 8836 L NORTH KOREA (1984) Various 15th-17th century Kings & Queens of Europe*. Airmail letter to USA franked with block of 9 different stamps in the form of an imperforate souvenir sheet from Michel Nos 2531//2611. 8837 L NORTH KOREA (1984) Various 17th-19th century Kings & Queens of Europe*. 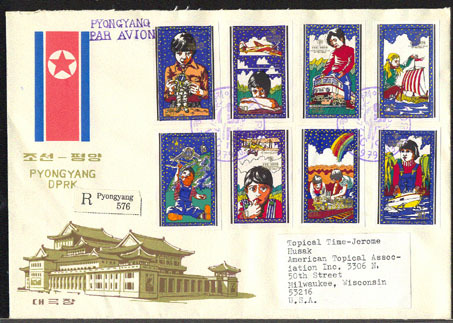 Airmail letter to USA franked with block of 9 different stamps in the form of a souvenir sheet from Michel Nos 2531//2611. 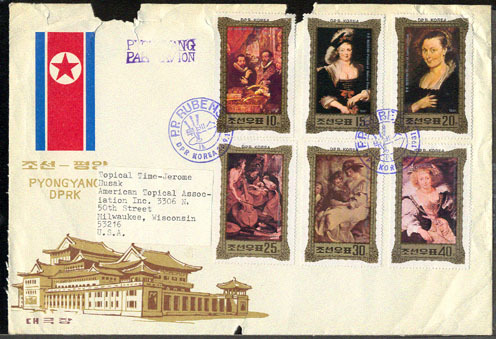 8838 L NORTH KOREA (1984) Various 17th-19th century Kings & Queens of Europe*. Airmail letter to USA franked with block of 9 different stamps in the form of an imperforate souvenir sheet from Michel Nos 2531//2611. 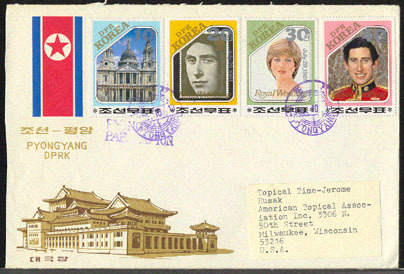 8839 L NORTH KOREA (1984) Various 19th & 20th century Kings & Queens of Europe*. 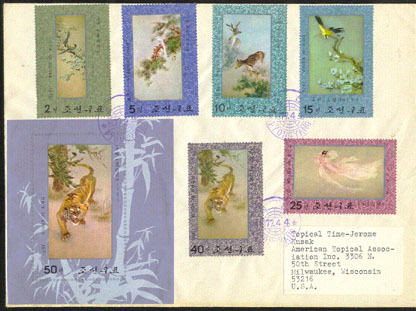 Airmail letter to USA franked with block of 9 different stamps in the form of a souvenir sheet from Michel Nos 2531//2611. 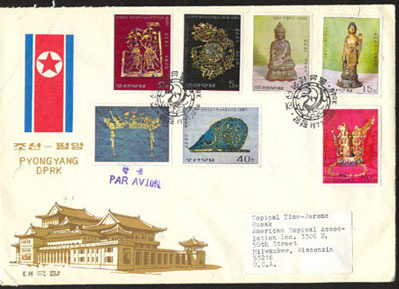 8840 L NORTH KOREA (1984) Various 19th & 20th century Kings & Queens of Europe*. Airmail letter to USA franked with block of 9 different stamps in the form of an imperforate souvenir sheet from Michel Nos 2531//2611. 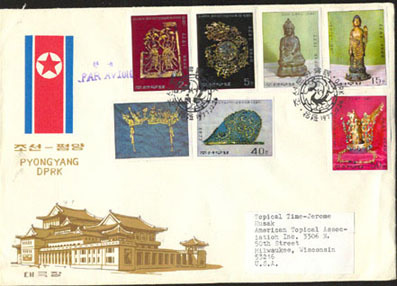 8841 L NORTH KOREA (1984) Various Kings & Queens of Europe*. 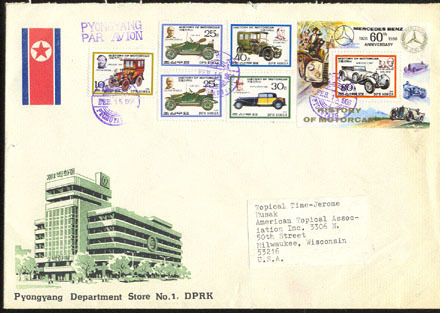 Airmail letter to USA franked with block of 9 different stamps in the form of a souvenir sheet from Michel Nos 2531//2611. 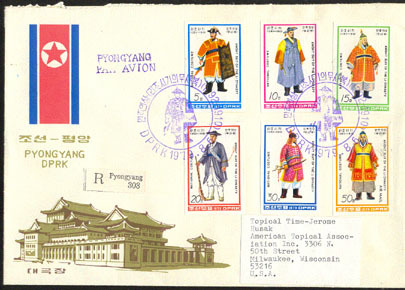 8842 L NORTH KOREA (1984) Various Kings & Queens of Europe*. Airmail letter to USA franked with block of 9 different stamps in the form of an imperforate souvenir sheet from Michel Nos 2531//2611. 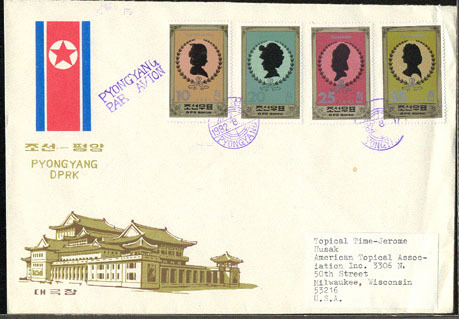 8843 L NORTH KOREA (1984) Queen Elizabeth II*. Registered airmail letter to USA franked with Michel Block 193. 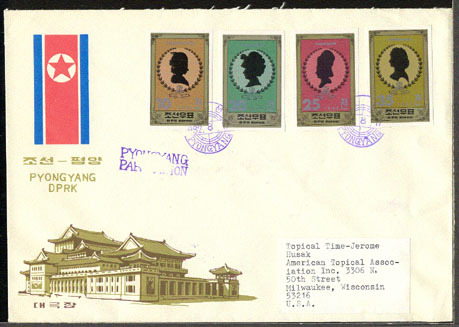 8844 L NORTH KOREA (1984) Queen Elizabeth II*. Registered airmail letter to USA franked with Michel Block 193 imperforate. 6461 L NORTH KOREA (1985) Mercedes*. Airmail letter to US franked with Michel Nos 2697-2700. Various Mercedes autos through the years. 6462 L NORTH KOREA (1985) Mercedes*. Airmail letter to US franked with Michel Nos 2697-2701 imperforate. Various Mercedes autos through the years. 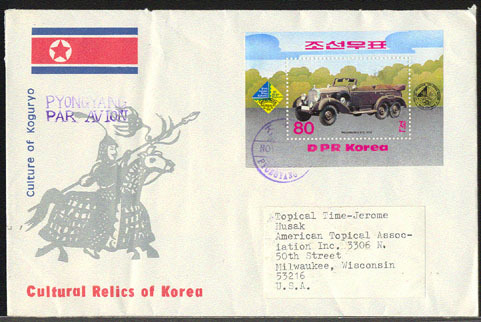 6463 L NORTH KOREA (1985) Mercedes-Benz W31 (1938)*. Airmail letter to US franked with Michel No 2701. 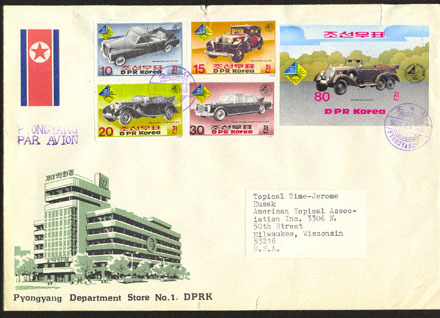 6465 L NORTH KOREA (1986) Various autos*. Airmail letter to US franked with Michel Nos 2713-7 and Block 211B imperforate. History of motorcar. 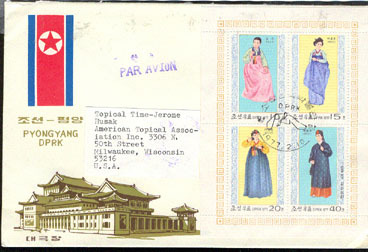 6466 L NORTH KOREA (1986) Various autos*. Airmail letter to US franked with Michel Nos 2713-7 and Block 211A. History of motorcar. 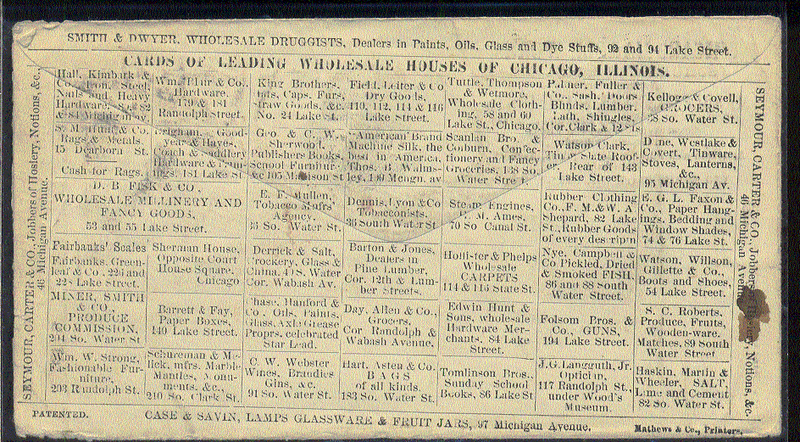 4620 L U.S.A. (1853) Tobey hospital. 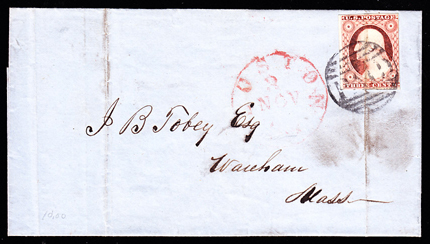 Letter addressed to J.B. Tobey, whose granddaughter founded Tobey Hospital in Wareham, Massachusetts, from the appraiser of the estate! Unfortunately no contents. 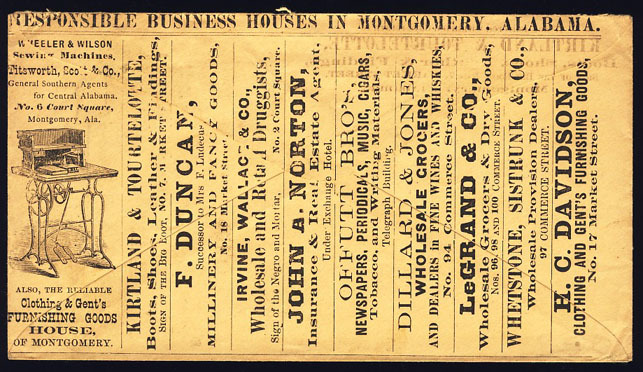 5610 L U.S.A. (1861) Wood. 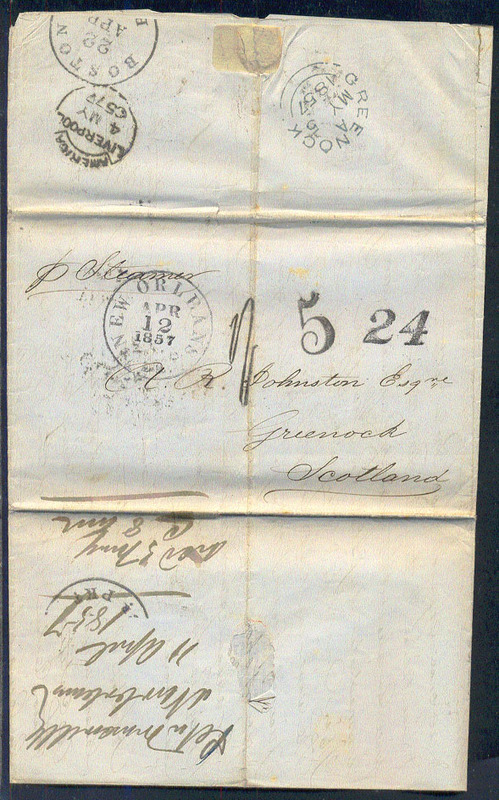 Double circle black postmark of Lumber City, PA dated May 10 on amber cover. Very fine. 9852 L ETATS UNIS (1919) Enfant* endormi et bâillant tenant une bougie* et un pneu de bicyclette*. 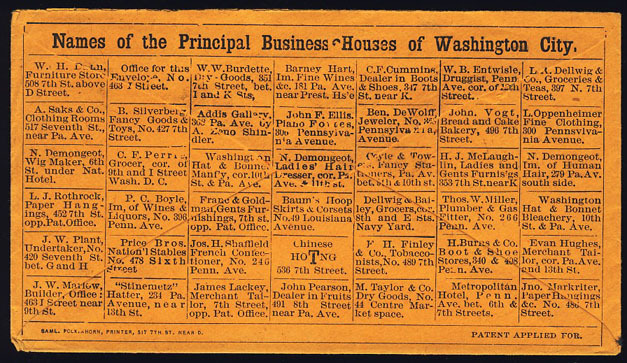 Enveloppe illustrée affranchie du timbre de roulette à 2 cents.Washington de la "Fisk Rubber Company." Joli pli! 10500 L U.S.A. (1929) Dedication of Roswell Airport. (1st Day). A classic cover and the first one to commemorate an Air Event by a Lions Club. 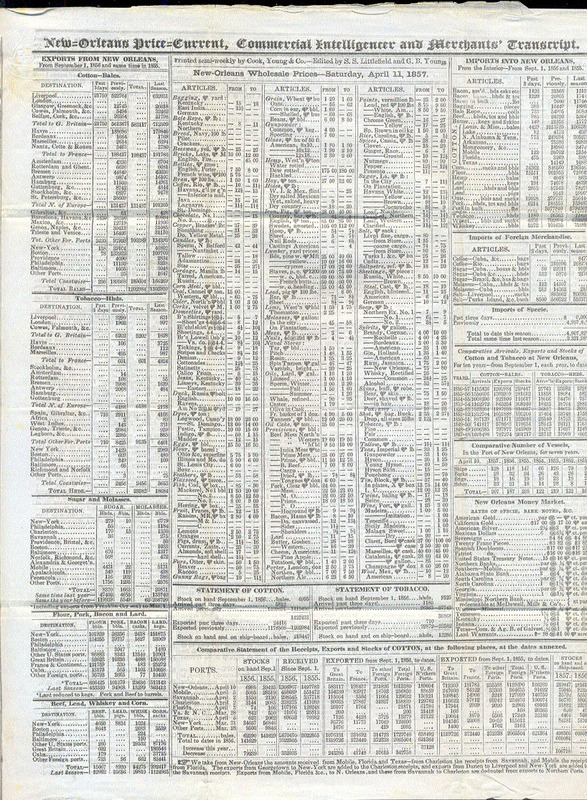 Dekom No 29 1204 Var. This event was sponsored by the Roswell, New Mexico LionsClub. The cachet consists of two handstamps: one diamond shaped in purple for the Lions Club, the other in light greenish blue features an airplane. Variety: autographed by the Mayor: John W. Hall. Very scarce! 10501 L U.S.A. (1929b) Dedication of Roswell Airport. (1st Day). A classic cover and the first one to commemorate an Air Event by a Lions Club. Dekom No 29 1204 Var. This event was sponsored by the Roswell, New Mexico, LionsClub. Color Variety: The cachet consists of two handstamps: one diamond shaped in purple for the Lions Club, the other features an airplane in light greenish blue instead of dark blue. Scarce! 10502 L U.S.A. (1929d) Dedication of Roswell Airport. (1st Day). A classic cover and the first one to commemorate an Air Event by a Lions Club. Dekom No 29 1204 Var. This event was sponsored by the Roswell, New Mexico, Lions Club. The cachet consists of two handstamps: one diamond shaped in purple for the Lions Club, the other in greenish blue features an airplane. Variety: large Roswell circular date cancel. Scarce! 4545 L U.S.A. (1930) Pittsburgh Air Show. March 6 to 15. A classic cover issued to commemorate the Kiwanis and Lions Day on March 13th. Dekom No 30 0313. 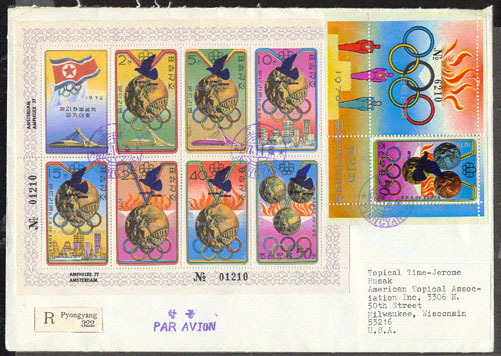 Beautiful bicolor cachet showing two airplanes, plus straight line handstamp reading The Path of the Eagle."" Scarce!"" 10503 L U.S.A. (1930) Pittsburgh Air Show. March 6 to 15. A classic cover issued to commemorate the Kiwanis and Lions Day on March 13th. Dekom No 30 0313. Beautiful bicolor cachet showing two airplanes, plus straight line handstamp reading The Path of the Eagle."" Scarce!"" 5516 L U.S.A. (1931) Wilkins-Ellsworth Trans-Arctic Submarine Expedition. Bergen to North Pole. 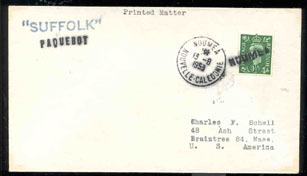 Cover franked with Scott No 554, Yvert No 229. One 1� pence Great Britain stamp for return postage. Handstamp with illustration of a submarine. 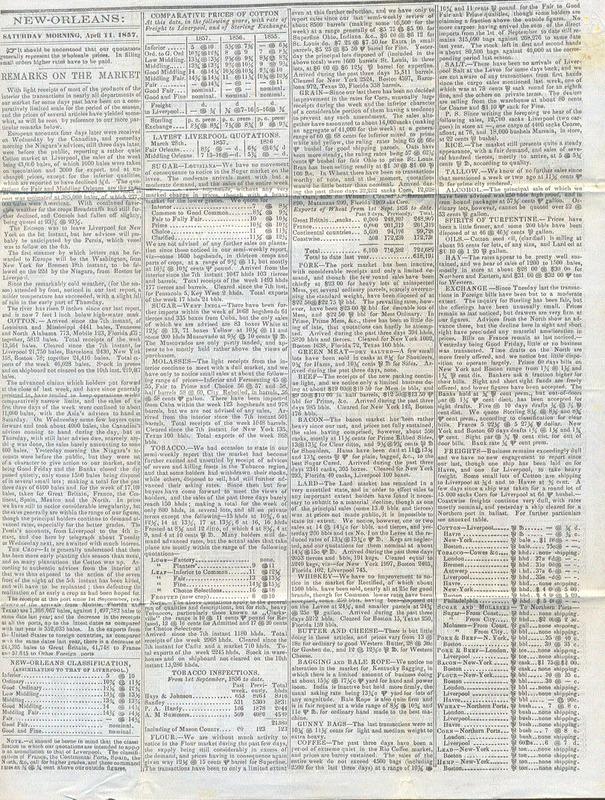 Opening cut-out on back. Nice combination! 10504 L U.S.A. (1931) Dedication of the Sanford, Florida municipal Airport. A classic cover Dekom No 31 0119. This event was sponsored by the Sanford Lions Club and is signed by its president: J.R. Hall. Scarce! 10505 L U.S.A. (1931) Dedication of the Sanford, Florida municipal Airport. 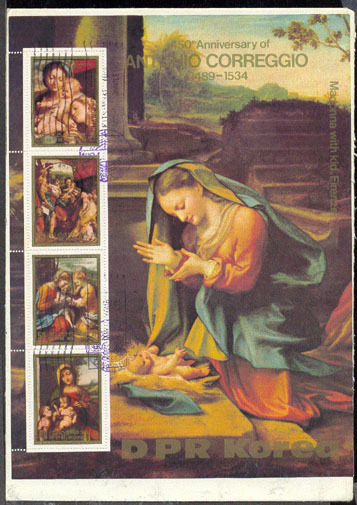 A classic cover Dekom No 31 0119 Var. This event was sponsored by the Sanford Lions Club and is signed by the Lions Club president and town mayor. Seal on back "Sanford, Florida - The Celery City." 15775 L U.S.A. (1931) Car crossing bridge*. 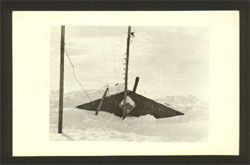 First Flight envelope (Bismarck, North Dakota to Los Angeles) with cachet showing auto crossing Liberty Memorial Bridge. 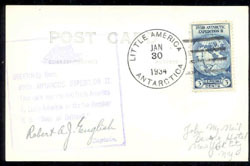 3191 L U.S.A. (1934) Byrd Antarctic Expedition II*. Scott No 733. Yvert No 323. Little America, Antarctica cancel. Matching illustrated cachet (ship) indicating that this card was carried from America to Little America on the Ice Breaker S.S. Bear of Oakland."" Stamp franking a very attractive black and white photographic postcard depicting base camp."" 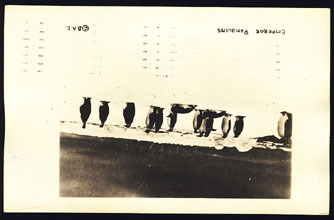 9183 L U.S.A. (1934) Byrd Antarctic Expedition II*. Scott No 733. Yvert No 323. Little America, Antarctica cancel. Matching illustrated cachet (ship) indicating that this card was carried from America to Little America on the Ice Breaker S.S. Bear of Oakland."" 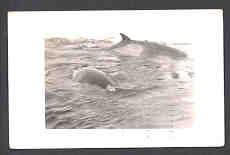 Stamp franking a very attractive black and white photographic postcard depicting emperor penguins."" 15155 L U.S.A. (1934) Byrd Antarctic Expedition II*. Scott No 733. Yvert No 323. Little America, Antarctica cancel. 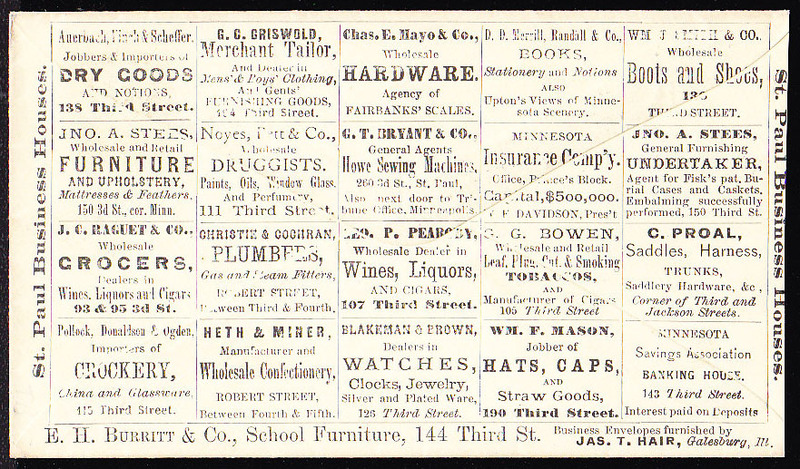 Matching illustrated cachet (ship) indicating that this card was carried from America to Little America on the Ice Breaker S.S. Bear of Oakland."" Stamp franking a very attractive black and white photographic postcard depicting camp on the trail with people and their skis."" 11108 L U.S.A. (1936) Lutheran Sanatorium. Crib*. Baby Jesus*. Christmas. Multicolor Christmas seal tied to postcard by neat Kansas city circular postmark on Christmas postcard franked by 1 cent Franklin, Scott No 552. Scarce! 9053 L U.S.A. (1952) Polar bear*. Nice Greenland multicolor label tied by handstamp of the Scandinavian Airlines System's First trans-arctic flight on cacheted cover! Departure and arrival date cancels. This label is hard to find on cover! Scarce!